Today during our weekly Mass Father Nick talked to us about the peace of Jesus Christ. Rather than giving a homily about the Devil, which was part of today’s Gospel reading, Father told the children he wanted to talk about the opposite, the “peace of Jesus.” He explained to the children that when we shake hands and we exchange the sign of peace before Communion, we are saying we will treat others as Jesus would treat them. He added that each person in the church represents all of the other people like Jesus. Therefore, when we shake someone’s hand, we are getting ready to receive Jesus in Communion. We are promising that we will continue to be respectful, kind, forgiving, and “be who we are and be that well. “ This is a nice message for children to hear in light of all the things that go on in our world. 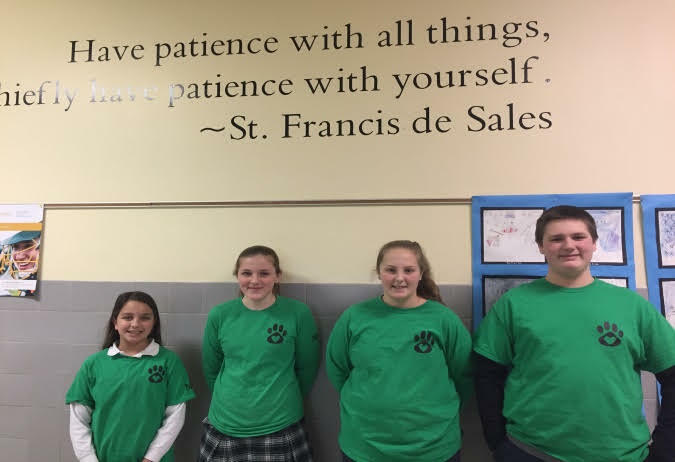 Congratulations to our September Students of the Month for showing the virtue of “faith” in all that they do. 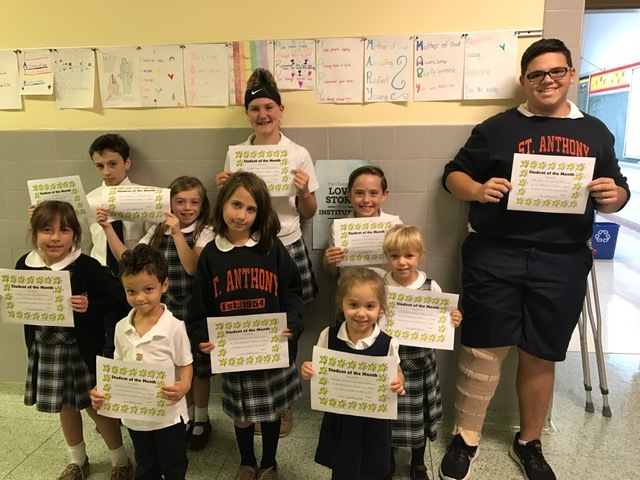 Faith was the September virtue of the Blessed Mother: Ezra Pabon (PreK3), Analeigh Manzanillo (PreK4), Gabrielle Krevchuk (K), Celeste Scarpato (1st), Emily Anderson (2nd), Anastasia Tsatsaronis (3rd), Brayden Carroll (4th), Zach Brelick (5th), Evan Cillo (6th), Makenna Sarver (7th), and Max DiOssi (8th). Thank you for your participation in the “Light the Night Walk” for Mateo! I want to tell you how very touching it was to see the fabulous turnout from our school families in support of Mateo. We had a beautiful night for the walk. 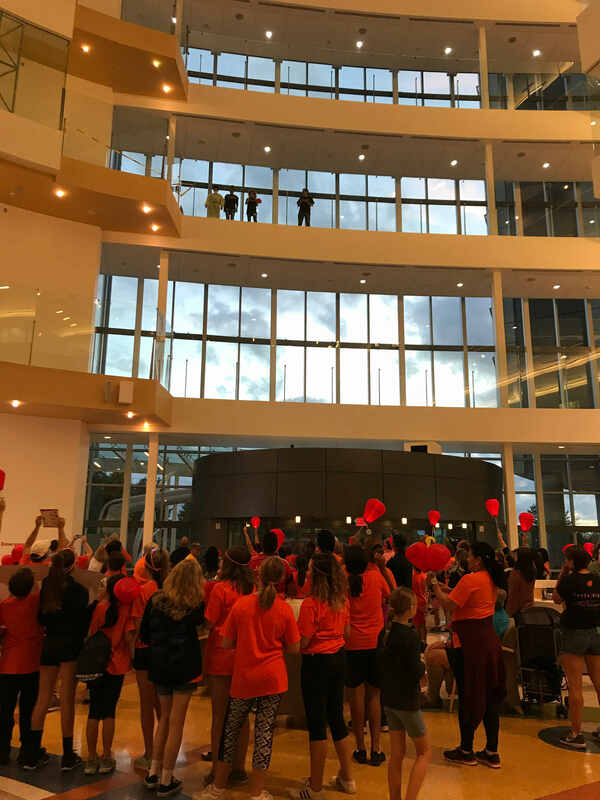 For those of you unable to attend, our school families filled the hospital atrium in a sea of orange where we waved and chanted to Mateo (who was standing up above on the third floor). Mrs. Ahumada said that Mateo felt the love and support of his friends. Our children, families, and staff all took part in the one mile walk around Nemours property. As we neared the end of the walk, we saw Mateo flashing his light from his hospital window. His father was there to be sure to point him out to us. We were able to carry lanterns representing those currently fighting, in memory of a loved one who has passed, and for survivors. Thank you on behalf of the Ahumada family for your prayers and love! Our students have some ideas they would like to do to support Mateo further. I will keep you posted once I meet with them. New Part-Time Teacher Assistant – Welcome to Carole Trzepacz! After many years of volunteering, Carole is now part of our staff. We decided to add a part-time teacher aide position to the 3rd Grade class. As one of the best and most dedicated volunteers in this parish, I have always joked with Carole that she should be on our payroll. Now she is official! Carole returns to the workforce after being home to raise her children. She is a very familiar face here, as she has served on the Home and School Board and many volunteer committees. Carole is currently on the YAC Board. We are thrilled that Carole has officially joined our faculty and staff. Thank you Karen Barker and Stephanie Phillips! Karen and Stephanie have offered to be our new volunteer cafeteria workers. We love our volunteers! Box Tops – Please continue to send in your Box Tops! The current Box Top contest will end on Friday, October 20th. Grandparents Day is approaching – Grandparents Day will be held on Thursday, October 26th. (More information will be coming home next Wednesday.) We ask that you please remind grandparents/special guests that they are welcome to come into school in the morning, but that the actual Grandparent Day program does not start until 9:00 A.M. Refreshments will be served starting at 8:00 A.M. in the Ballad Room. The day concludes at noon, after the 11:00 A.M. prayer service in our school gymnasium. Parents – please remember that there is no After-Care on noon dismissal days. Parent-Teacher conferences will be held that day and evening. Halloween – Look for flyers coming home soon about Halloween and the Student Council Candy guessing game. The Home and School Halloween Party will be held at school on Friday, October 27th. More details will follow. Sunday, October 15th – Ursuline Academy Open House – 1:00 P.M.
PreSchool Field Trip – Milburn Orchards – 8:30 A.M. – 12:00 P.M.
Student Council Meeting – PreSchool – 3:00 – 3:30 P.M.
2nd Grade First Penance Meeting – Ballad Room – 6:00 – 8:00 P.M.
Tuesday, October 17th – Math League Practice – Middle School – 3:00 – 4:00 P.M.
Saturday, October 21st – Confirmation Retreat – Meet in Ballad Room – 9:15 A.M.
Sunday, October 22nd – Open House at St. Elizabeth’s High School – 11:30 A.M.
Open House at Padua Academy – 1:00 P.M.
Monday, October 23rd – Confirmation Meeting – Ballad Room – 6:15 P.M.
Tuesday, October 24th – Math League Practice – Middle School – 3:00 – 4:00 P.M.
Wednesday, October 25th – 6th Grade Field Trip – Ellis Island – 7:00 A.M. – 6:30 P.M.
Grandparents Day – Grade School – 9:00 A.M.
Parent-Teacher Conferences – 1:00 P.M. – 7:30 P.M.
Friday, October 27th – Home and School Halloween Party – Grade School – 6:00 P.M.
Tuesday, October 31st – Math League Practice – Middle School – 3:00-4:00 P.M.
Today at Mass, Father Mark Wrightson celebrated with us the Feast of the Archangels, Saints Michael, Gabriel, and Raphael. Father told the children that the Archangels were the “highest rank” of Angels sent to watch over us and remind us that God loves us and is always with us, in everything we do. When we are nervous, God is there to reassure us and let us know we are never alone. When we accomplish something, God was there to give us strength. He added that God is always with us because He CAN be, and His angels are His helpers. God often sends messages to us through these special angels. When we pray to the angels, God hears us. At the end of Mass Father Wrightson had the students clap for the angels in thanksgiving for assisting us with a beautiful Mass. He thanked the angels for helping the Antonians sing, the altar servers to serve, the readers to spread the Word, and each of us to participate fully. In October, we will be celebrating the Joyful Mysteries of the Rosary with a focus on the virtue of obedience. We purchased new Rosaries for all of the students and staff this year to highlight the significance of Mary and praying the Rosary in our schools this year. Family Surveys: Thank you for your cooperation with this important form that helps ensure that we receive quality Title One services for our students! Blessing of the Animals is Tuesday, October 3rd at 2:00 P.M.: Please bring your family pets to our annual Blessing of the Animals. We will gather in the field adjacent to the school, and the blessing will begin promptly at 2:00 P.M. If you are unable to attend, your child is welcome to bring a favorite picture of their beloved pet or may even draw a picture. Father will happily bless pets and pictures. Wednesday, October 4th is our Pilgrimage to Our Lady of Peace Statue: This is a special day celebrating one of the many traditions of our Catholic faith – the Rosary. We will travel to Holy Spirit Parish in New Castle where students around the Diocese will gather to pray the Rosary with Bishop Malooly. Only 8th Grade Students and Antonians will attend this event. School uniforms must be worn this day, in order for a child to participate. Gym uniforms and sneakers may be brought to school that day and changed into when we return. Thursday, October 5th is a Noon Dismissal: Please arrive on time for dismissal, as library construction will begin shortly after noon. There is no after care on noon dismissal days. The Walk opens at 4:30PM, with the actual Walk portion kicking off at around 7PM or dusk. Before the Walk there are many activities and free food for guests. Please enter the main gate at Nemours/Alfred I. duPont Hospital for Children from Children’s Drive. Once you’ve entered the main entrance of the hospital there are two parking lots on the right. Please park in one of those. You will see the event is in the hedged in area right in front of the bell tower. The Registration Tent is right behind the parking lot. We’d like for you to register ahead of time, but if you can’t until the Walk we can register you there. The Walk will kick off right there by the bell tower, will continue through the Mansion gardens and round back by the hospital. School is closed Friday, October 6th and Monday, October 9th: Enjoy the long weekend with your children. We will miss them! We will all be attending a Diocesan-wide Professional Development day on Friday at St. Mark’s High School. On Monday, school will be closed in observance of Columbus Day. However, Mr. Shields and I will be attending the Columbus Day Communion Mass and Breakfast. We once again look forward to the very generous donation from the Columbus Day Committee to help with our technology renovations in the library. The Columbus Day Committee has been responsible for several advances in our technology, helping us market our school, and helping us serve our students who are avid digital learners. September 19, 2017 — (Wilmington, Delaware) — The Most Rev. 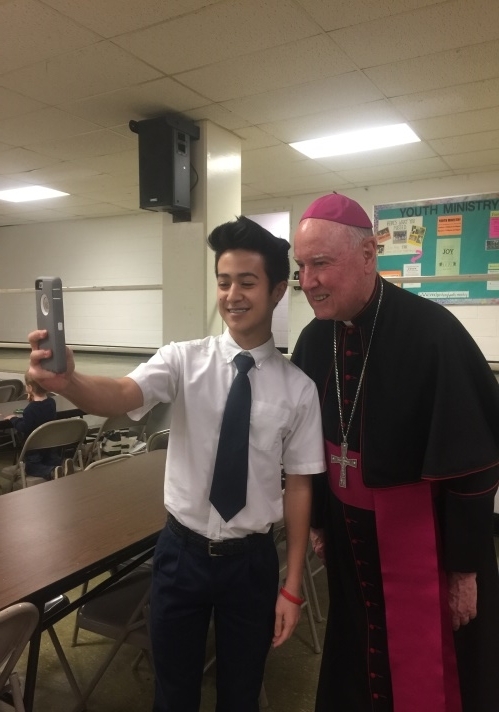 W. Francis Malooly, Bishop of the Catholic Diocese of Wilmington, announced today that any student currently attending a Catholic elementary or secondary school in a hurricane-battered diocese may attend a Catholic school as a tuition-free diocesan guest for the 2017-2018 school year. “A number of families must re-locate due to the recent hurricanes and the Diocese of Wilmington wishes to assist any who may come to Delaware or the Eastern Shore of Maryland in continuing the faith and academic development of their children while they re-build their lives and their homes,” said Dr. Louis De Angelo, Superintendent of Schools for the Diocese. “We recognize the tremendous work that lies ahead for re-located families and we wish to assist them in continuing their children’s Catholic school education without tuition worries,” Bishop Malooly said in letters to the Archbishops of Galveston-Houston and Miami. For over 185 years, Catholic schools have been serving the needs of area families by offering a Christ-centered educational alternative. The Catholic Diocese of Wilmington was established in 1868 and comprises 56 parishes, 18 missions, and 36 schools serving the State of Delaware and the nine counties of Maryland’s Eastern Shore. Library Renovations: Phase One of construction begins next Thursday, October 5th! Stay tuned as we transform our traditional library into a 21st Century Digital Classroom! The dumpster will be moving in next week. It will be placed in front of the school, and we have asked to have a fence installed around it for safety. Construction work (particularly demolition) will not take place during school hours. Bancroft Homes will be working in the evenings and over the weekend. I am asking that you please take your children to the playground or field after school, rather than allowing them to play in the grassy area next to school as usual. Monday October 2nd – 6:15 P.M. in the school cafeteria. Each student candidate should be present with his/her Sponsor and at least 1 parent. Saturday, October 21st – Confirmation Retreat for student candidates begins at 9:15 A.M. Parents and Sponsors should meet at 5:30 P.M. in the church for a Mass together. Lunch is provided. Monday, October 23rd – 6:15 P.M. in church. Student candidates will meet for a session with Father Nick Waseline. Monday, November 13th – 6:15 P.M. meeting in the cafeteria for just student candidates. There will be a speaker from Generation Life. Friday, December 8th – Dress Rehearsal. Students are to come to church at 5:45 P.M. wearing their Confirmation outfit. Sponsors should be in attendance. Saturday, December 9th – Sacrament of Confirmation at 10:00 A.M. in church. Students report to the cafeteria at 9:15 A.M. Parents and Sponsors will meet the students in church. Wednesday, November 15th – Sacrament of First Penance in church at 6:15 P.M.
Tuesday, October 3rd – Blessing of the Animals – School Field – 2:00 P.M.
Wednesday October 18th – St. Anthony’s Family Night at Bertuccis. Visit either location (Rt. 202 or Kirkwood Highway) all day. Join your teachers after school for dinner! Friday, October 20th – Trimester One Interim notices will be sent home. Friday, October 27th – Home and School Halloween Party 6:00-8:00 P.M. It has been an exciting 2 weeks of school in more ways than one. I would like to thank all of you who came to our Back to School Home and School Meeting. We had an excellent turnout. For those of you who missed the evening, feel free to call me with any questions. We reviewed our school mission, our Diocesan motto and theme for the year, “To Jesus through Mary,” discipline and communication policies, and heard a few school, parish, and Home and School updates. Our Pastor, Father Nick, welcomed everyone and thanked the parents for choosing our parish school. He assured them that they made the best choice. Today at our first school Mass Father Nick introduced our new Associate Pastor, Father Mark Wrightson. Father Wrightson joined us for our faculty retreat and we are thrilled to have him with us. Today is the Feast of Our Lady of Sorrows. Father Nick did a wonderful job of explaining the 7 sorrows of Mary. He told the students that our Blessed Mother had times in her life when she was very sad. Father Nick gave them examples of Mary hiding with her baby in fear for His life, watching her son be nailed to the cross, and worrying when He went missing as a young boy. Father Nick told the children that Mary is sad and cries for us when bad things happen in our world and that she is always with us. He let them know that whenever we talk to Mary, we are talking to Jesus because Mary and Jesus together are always there for us. Our Blessed Mother will be our focus this year. Personally, she has always been my focus of prayer. When my son had cancer and was fighting for his life, I prayed the Rosary constantly, and it was a source of great comfort to me. I want you all to know that yesterday when one of our students passed out and was in the hallways waiting for EMTs, her classmates did not carry on. They did not make a sound. They were not disruptive. Instead, they began to pray the Rosary, on their own, without adult leadership in the classroom. One student started, and the entire class joined in. We had eyes on the class, but were not attending to their needs. This is precisely why I love Catholic school. When given the opportunity to be social, our students decided to unselfishly pray the Rosary for their friend. I had to share that with you. It brought tears of pride to my eyes and Ms. Casale’s. Your children are fabulous! The good news is that our student who passed out yesterday was discharged and home before bedtime last night. She should return to school on Monday. This Tiger Talk will be less about updates and more about prayer requests today. We are a truly blessed parish, but we have several families in need of your prayers. The students are NOT aware of my next update. You are the first to know, and I ask that you use your discretion this weekend in sharing the news with your children, if and how you see fit to do so. One of our 6th grade students, Mateo Ahumada, is presently at Nemours A.I. DuPont Hospital for Children. Mateo was just diagnosed with Leukemia. He is in good spirits and doing well considering his recent diagnosis of Leukemia two days ago. He is already receiving treatment. Mateo, who happened to be my son’s church buddy, is currently in the same room my son was in at A.I. and is receiving care from the same incredible medical team. Mateo will have the best care! I am sure of it. I find it interesting that Christopher was Matteo’s church buddy. I believe that is a good sign. My son is happy and healthy at the University of Delaware, and I have true faith that Mateo will be happy and healthy again in God’s time. Mateo’s mom asks for your prayers. Again, I can personally tell you that this parish school family is amazing, and your prayers can make miracles happen. You prayed for Father Nick (Stage 4 pancreatic cancer), and he is back to work and giving his terrific homilies to your children. Please pray for Mateo and his entire family, as they adjust to their new normal. Please refrain from visiting at this time. This is a lot to process. They currently do not have a specific name for what type of Leukemia Mateo has, so there is a lot of planning and coordinating to do. They should have some details today. I promise to keep you updated any time his mom shares with me. Today she simply asked for prayers, and I assured her she had them. Sadly, we had a school parent pass away suddenly and unexpectedly yesterday. Emily Anderson (2nd Grade) lost her mother, Jennifer Clare Burgun, at the young age of 40. Funeral services are this upcoming Tuesday at 11:00 A.M. here at St. Anthony’s. Please keep sweet little Emily and her entire extended family in your prayers. We did not share this information with the students in Emily’s class, due to their age. On a happier note, Nick Mercantini, our student who was paralyzed from the neck down last year in a trampoline accident, is making progress again after a setback. Nick went into cardiac arrest at home a few weeks ago and was rushed back to Nemours. Fortunately, he is no longer in ICU. Stepping down from ICU is a good thing. It is actually a step up. He can now have PT and OT more frequently on the unit. Progress is slow, but it is certainly progress. Nick’s family is so very thankful for your prayers and asks that you continue to hold them in prayer. Let’s keep all of our children and families in our prayers. This is a strong and powerful community. Thank you! You are part of a great team! I hope you will consider joining us for one of our Friday Masses. Our Masses are every Friday at 8:00 A.M. (unless there is a Holy Day of Obligation during the week). Altar servers needed! If your 4th – 8th Grade child is interested in becoming an altar server, please contact Mr. Bob Shields at bshields@stanthonynet.org. Please join us for the first parish social of the fall, to be held on Sunday, October 1st, after the 9:00 A.M. and 11:00 A.M. Masses in the Ballad Room of the Grade School. Enjoy a variety of great food, including tomato pie and donuts from Serpe’s Bakery, breakfast pizza from Degnar’s Greenhill Deli, and other delicious food selections including mini-bagels and fresh fruit while catching up with fellow parishioners and friends. We hope to see you there! Saturday, September 16th – Cross Country Meet – Brecknock State Park – 9:00 A.M. Varsity Volleyball Game – Ursuline Academy – 10:00 A.M.
JV Volleyball Game – St. Peter’s New Castle – 12:00 P.M.
Sunday, September 17th – JV Volleyball Game – Fournier – 12:00 P.M.
Thursday, September 21st – CDOW Boy Scouts Meeting – Ballad Room – 6:00-8:00 P.M.
Friday, September 22nd – Varsity Volleyball Game – Fournier – 6:00 P.M.
Saturday, September 23rd – Varsity Volleyball Game – Holy Angels – 1:00 P.M.
Sunday, September 24th – Cross Country Meet – Tatnall School – 1:00 P.M. Varsity Volleyball Game – Fournier – 12:00 P.M.
JV Volleyball Game – Fournier – 2:00 P.M.
Monday, October 2nd – 8th Grade Confirmation Meeting – Ballad Room – 6:00 P.M.
Wednesday, October 4th – Our Lady Queen of Peace Pilgrimage – Holy Spirit Church – 10:00 A.M. I hope to see some of you this Sunday at our Home and School Crab Feast! Our next Tiger Talk will be alive with pictures. At this time I held off on inserting pictures, as we await a few more of your signatures on Photo/Video Release Forms. Be our friend on Facebook at St. Anthony of Padua Grade School Families, Alumni & Friends. Please visit our website for upcoming calendar events. This calendar is updated daily. This week we gathered as a school community for one of my favorite events of the year, the May Procession. This tradition is a wonderful way for us to honor Mary during her special month. The students were reverent (and adorable) while processing in and out of church. Our May Court did a lovely job with their readings and crowning of Mary. Thank you to Mr. Shields for organizing both the May Procession and the practices that come before it, and thank you to the teachers for helping students remember this is a special event for them to partake in. And as always, thank you to the parents, families, and friends who came to join us in our celebration of Mary. God Bless Mrs. O’Brien on her Retirement! – It is with very mixed emotions that I announce Mrs. Bernadette O’Brien’s retirement. She has been a fixture here at St. Anthony’s. I have had the privilege of working by her side for my past 16 years. For 20 years, she has taught here and has touched the lives of hundreds of students over those years, including my own two children. Mrs. O’Brien was instrumental in starting one of the students’ favorite field trips, Ellis Island. She receives a grant every year that funds this entire trip for the students to reinforce their Social Studies curriculum on the topic of immigration. Mrs. O’Brien was responsible for bringing back the 8th Grade field trip to New York City. She served as a Student Council Moderator for years. She has been the Yearbook moderator for a few years and has served as the Level Coordinator for Middle School. High school and college students very regularly return specifically to see her and get a famous motherly hug. Her students love her and know that she is always there for them. Long after they graduate, Mrs. O’Brien takes pleasure in their successes and is there for them in times of struggle in their families. Several students come to mind in my many years here as a school counselor. Mrs. O’Brien has already made travels plans with her husband for this upcoming September- her first free September in 20 years. She will now be able to enjoy time with her young grandson, Danny. We thank Mrs. O’Brien for her unending love, her cheerful attitude, contagious smile, optimistic outlook, and endless patience. We are sad to see her go, but so very happy for her to once again have family time, something that so often suffers tremendously in the life of an educator. Mrs. O’Brien has helped us live our school mission and helped each student to “be who they are and be that well.” God bless Mrs. O’Brien! We expect to see her again in September, once she realizes she misses us and simply can’t stay away. 2017 Community Builder Awards – Congratulations to Josephine Rybicki, Yolanda Capriglione, and Carole Trzepacz for earning this award for their years of service and dedication to our school and parish community. These ladies have worked thousands of hours in their service to our parish. Jo is most often seen working cafeteria, the book fair, Secret Santa Shop, Open House, Christmas pageant, Via Crucis, and many more events throughout the year. She works tirelessly during our festival as well. Yolanda has spent many years working in our school cafeteria, setting up for May Procession, and working every day and night for our Festival. I often tease Carole that she should actually be on our payroll, because she is here as much as some of my staff. Carole has been on the Home and School Board, YAC Board, and she is a substitute for our teacher assistants. These women have been an asset to our school and parish, and I am thrilled that they were chosen for this special honor and will be celebrated by our community for their selfless dedication to our school, parish, and community. Spring Band Concert – Please join us for our annual Spring Band Concert at 2:00 P.M. in the Ballad Room on Tuesday, May 16th. Please note the change in location. Typically this is held in the school gymnasium; however, this year we will have the Excellence Fair set up at that time. Calling All Parents –Field Day is fast approaching! On Wednesday, May 24th, from 8:30 A.M. to 12:30 P.M., we invite you to join us! We are looking for help – one of the nine stations that the students will be participating in is the Water Balloon Toss. If you are able to fill balloons for your child’s homeroom, please contact your child’s teacher. Balloons need to be in school by 8:00 A.M. on May 24th and can be transported in a cooler. Thank you as always for your continual support! Teacher Planning Day is Friday, May 26th – Noon Dismissal for Students – On Friday, May 26th, the students have a noon dismissal to start the much anticipated Memorial Day weekend. Please be prompt in picking up students at noon. Teachers will be staying for a Professional Development Day that begins at noon. I appreciate your cooperation. 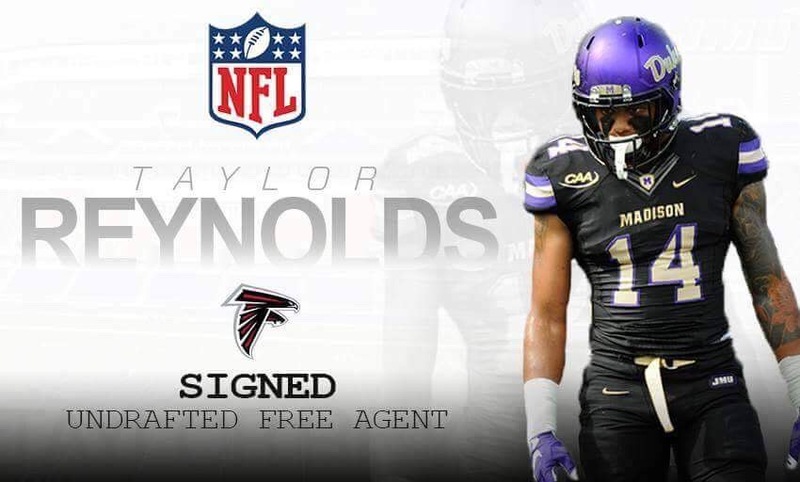 Congratulations to Taylor Reynolds – Class of 2008 -As a major football fan, I am thrilled to announce that a former graduate, Taylor Reynolds, received a call and accepted a free agent position with the Atlanta Falcons. 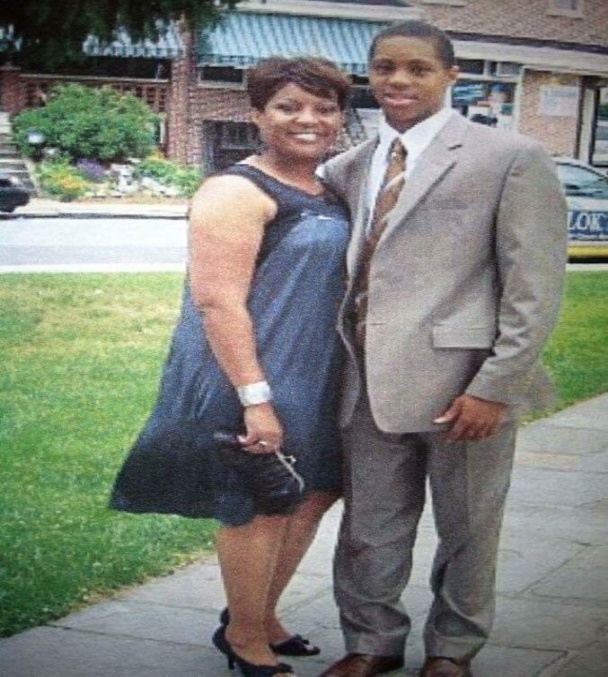 Taylor graduated from St. Anthony’s in 2008 and from Newark High School in 2012. Taylor graduated from James Madison University on May 6, 2016 with a Bachelor of Science degree in Justice Studies with a concentration in Intelligence Analysis. 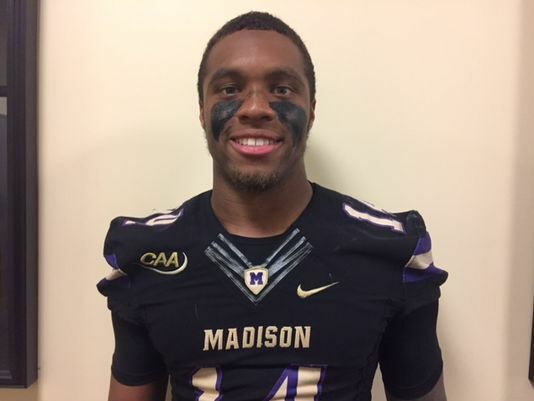 This past season he took 4 Graduate level courses at JMU because he had a 5th year of eligibility to play football. Taylor was a bright, energetic, positive young man. His smile was and still is contagious. Taylor recently came back to speak at our Sports Banquet. He spoke highly of his time here and the influence our teachers had on him with their love, support, and high expectations. I sent his mother Carmen a message telling her how proud we all are of Taylor. 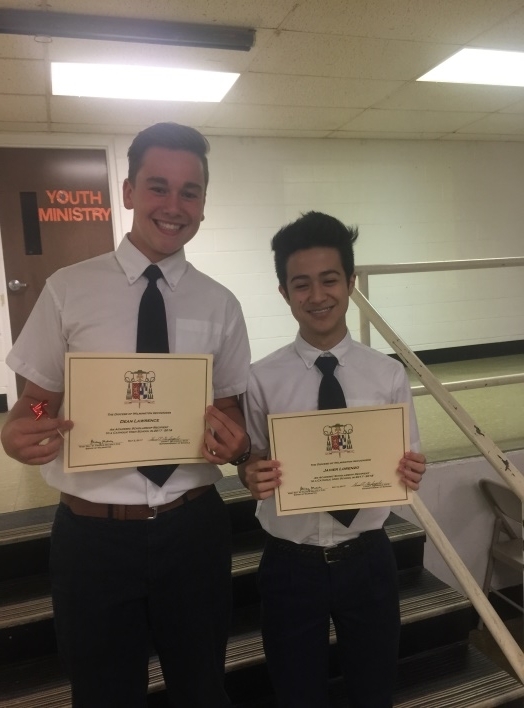 Scholarship Convocation – Mr. Shields and I had the pleasure of attending the 8th Grade Scholarship Convocation at St. Mary Magdalen last week. This event recognizes the academic scholarships earned to attend one of our Catholic High Schools. We celebrated with Javier Lorenzo and Dean Lawrence. We were beaming with pride. Our students represented us well. And I must add that if there were an award for best dressed and best hair, the boys would have won those awards as well. Congratulations to our 2nd Grade class on their First Communion. They worked so hard this year to prepare for the Sacrament of First Eucharist. They looked as beautiful as they sounded singing my favorite song, “Jesus Has a Home in My Heart.” I would like to give a special thank you to Ms. Rita Casale and Mrs. Leticia Broujos for their dedication to the faith formation of our students during this most sacred time in their lives. Thank you to Mr. Colligan for contributing his music and encouraging the students to actively participate in their special Mass. Congratulations to our April students of the month! April’s fruit of the Holy Spirit was gentleness. These students show their kindness and compassion with a gentleness that makes all around them feel welcome. 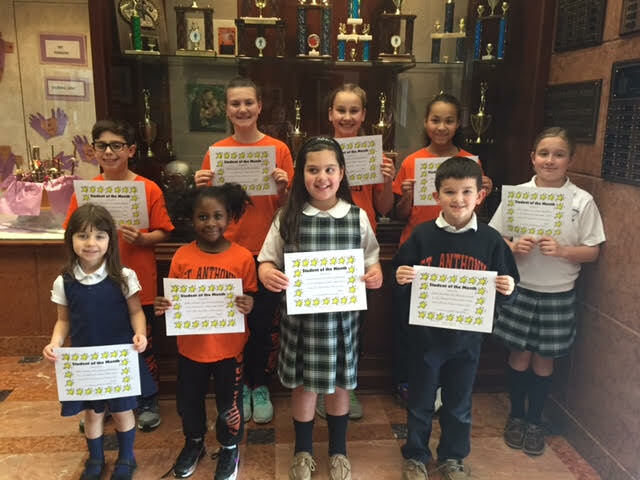 Congratulations to Matthew Spinelli (PreK 3), Bryson Windsor (PreK 4), Raphael Arias (K), Nathanial McGowan (1st), Payton Sarver (2nd), Aubrey Messina (3rd), Paulina Sidhu (4th), Mikaela Brown (5th), Korina Aguilar (6th), Hannah Fagioli (7th), and Katie Collier (8th). Great job! 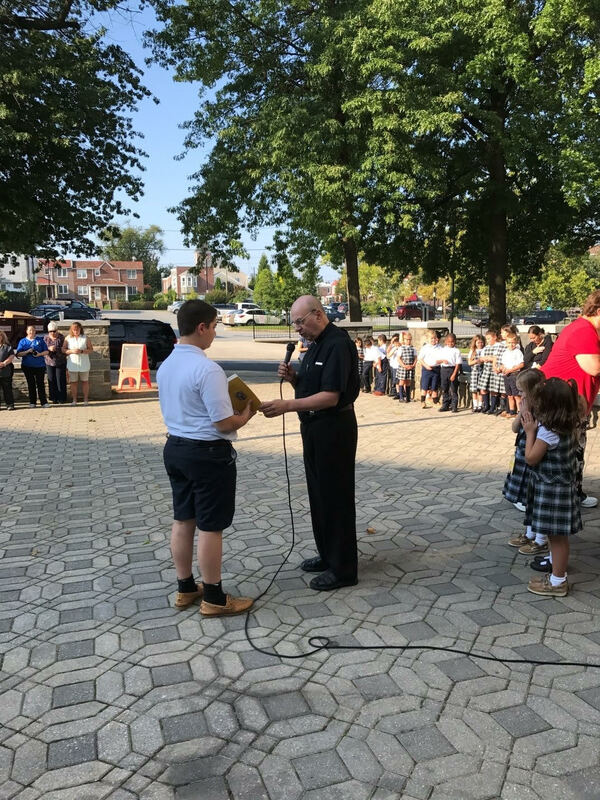 Padua Honor Roll – Congratulations to our St. Anthony graduates who earned Honor Roll at Padua Academy during the 3rd Quarter. First Honors: Ellen Banker, Christina Molloy, Andrea Reynolds, Robin Land, and Reagan Widmaier. Second Honors: Maggie Banker, Laura Land, Grace McCarthy, Stefania Lombardo, Caroline Achenbach, and Melissa McCarrick. Way to go, ladies! Keep up the great work. You make us proud! Home and School Elections – Please be sure to come out and vote, and to meet our new Home and School Board Officers on Wednesday, May 17th at 6:30 P.M. in the Ballad Room. A treat from the Home and School Board will be served. Bring the children! Summer Reading Event at Barnes & Noble and Spirit Day at Grub Burger – St. Anthony of Padua Grade School is holding a fundraiser on Monday, May 22nd, at both Barnes & Noble on Concord Pike and Grub Burger located in Concord Mall. Our school will receive a portion of the proceeds. Come out and enjoy a delicious meal, purchase summer reading books, and support our school. We hope to see you there! The event at Grub Burger is all day. Flyers will be handed out in school on Thursday, May 18th. Please turn it in when you place your order. You can also mention St. Anthony’s School when you order if you do not have a flyer. The event at Barnes & Noble is also all day. Teachers and staff will be at the store from 4:00-7:00 P.M. to greet everyone. Flyers for Barnes & Noble will be handed out in school on Thursday, May 18th. **Please note that online orders can be placed from May 22nd through May 27th using book fair ID 12150561. Thank you for your support! Expanded Preschool Program 2017-2018 – We are excited to introduce and offer a part-time program for those preschoolers not quite ready for a full day of school. Spread the word about our awesome preschool program. *A teacher will dismiss the child to the parent in the lobby at 11:00 a.m.
*Late fee charged for pick-ups after 11:00 A.M.
*Schoolwork will not be saved for the days that the student is not present. Any parent who chooses a half day option will meet with the teacher briefly on Back-to- School/Meet-the-Teacher Night. Festival Equipment – As we approach the end of the school year and the workings of setting up for the festival, please be careful allowing the children to play outside of school after dismissal. Our facilities crew will work hard to keep all materials out of the reach of children; however, we know our children are capable of finding dangerous equipment. Tractors and trailers are now moving back into town. Major equipment will not move into the building until the last day of school. On that day, June 7th, please arrive promptly at 10:30 to pick up your child as equipment begins to move in and around the school and buildings as soon as the children are dismissed. Preschool 3 finished learning all the letters of the alphabet. They even had a graduation ceremony! Preschool 4 has been working on sights words and summer crafts. Preschool 3 and 4 had a lovely Mother’s Day breakfast on Thursday. Thank you to all the moms for coming to the event. Kindergarten has been learning about bones and the human skeleton. They have really enjoyed learning the different bones; they especially loved dancing to the song “Dem Bones”. Kindergartners have also done posters on one of the Five Senses, as well as answered questions in a booklet about it. 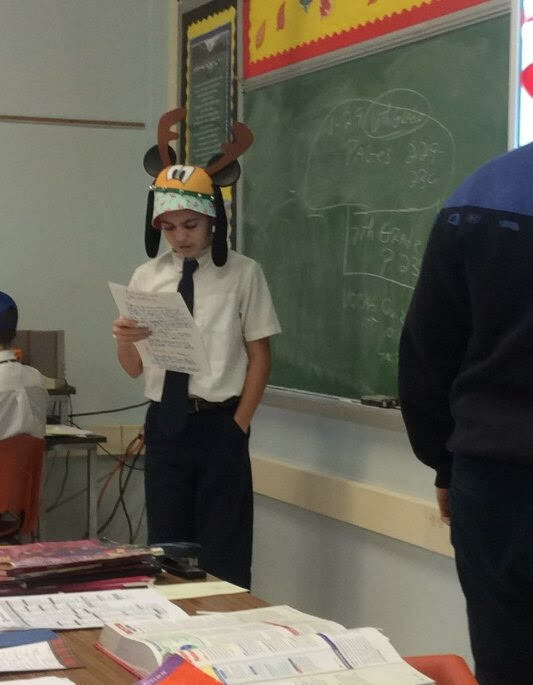 They brought their projects to school and did a 2-3 minute verbal report on it. They did an awesome job on the reports! 1st Grade did a wonderful job on their Animal Habitat projects. They are looking forward to the end-of-the-year field trip to the Philadelphia Zoo and learning more about animals. 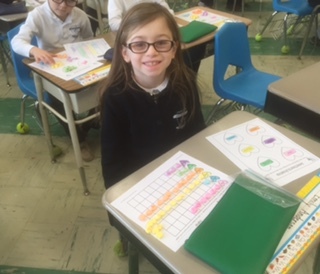 2nd Grade is doing Geometry in Math and some students are starting to learn multiplication. They are learning to do a PowerPoint presentation and are really excited that they can now receive communion with our school community at the Friday Mass. 3rd Grade participated in the Delaware Arbor Day Poster Contest. This year’s theme was “Trees Are Terrific…From Acorn to Oak!” All the 3rd graders were given a loblolly pine seedling to plant at home (for participating in the contest). 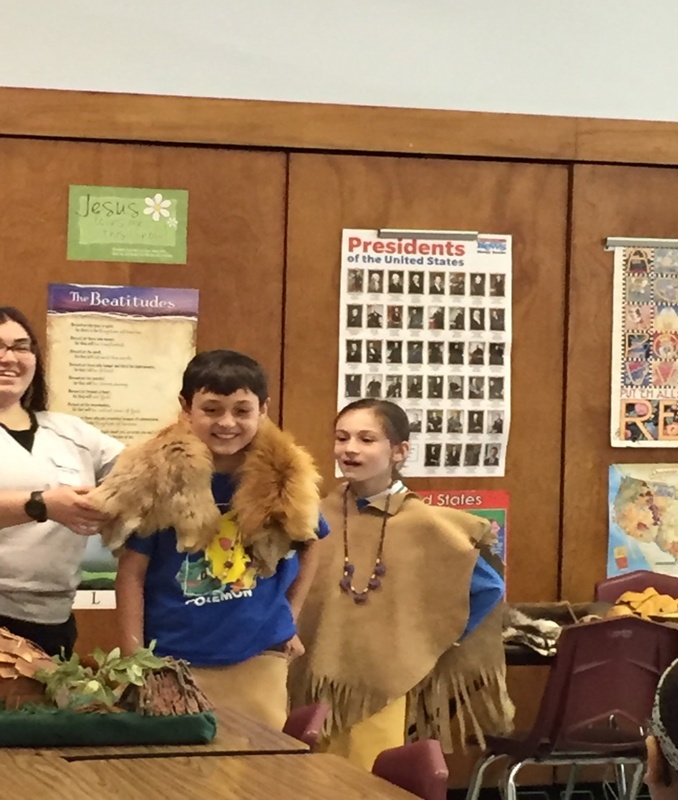 4th Grade – On May 8th, the 4th grade had presenters from the Delaware History Museum come and teach about the first people in Delaware, the Lenni Lenape Indians and immigrants who came from Europe to settle in our state. The students had a wonderful time listening to stories, participating in reenactments, and doing cooperative activities. They also created a pouch, which is a Russian immigrant family tradition. They learned the meaning behind the items in the pouch from the book, The Keeping Quilt. Natalia and Richie modeled Lenni Lenape traditional clothing. 3rd and 4th Grade will be going on a trip to the Delaware Solid Waste Authority to learn about what happens to trash, how a landfill works, and why it is important to recycle. 5th Grade has been learning about the U.S. Constitution, Bill of Rights, and the branches of the government. They just finished making movies about earthquakes on BrainPop, which they showed to class. The 5th Graders are looking forward to their field trip to the Philadelphia Museum of Art next week. 6th, 7th, and 8th Grade Reading Students competed in a Poetry Slam contest this week. Students were paired up randomly and had to perform an oral poem on their similarities and differences. The top three pairs from each class had their performance recorded and were awarded treats. It was great seeing all the Middle School Talent. 8th Grade is very excited as they finish up their year(s) here at St. Anthony’s. They enjoyed participating in the May Procession and are looking forward to their trip to New York City on May 17th. The whole class is anticipating, with bittersweet thoughts, their graduation ceremony on June 6th. On a special side note, these 5 graduating 8th Graders were members of the first preschool class here at St. Anthony’s. They started 10-11 years ago in the Pioneer Class of our Preschool Program at the ages of 3 and 4. Mrs. Achenbach taught them both as Preschool students and again in Middle School.
. Registered participants will receive a race t-shirt, post-race refreshments, and a coupon for breakfast at the La Piazza Cage. Pre-registration fee is $25 (valid through Thursday, June 8th). Passes are a great gift for graduation or any occasion! Gift cards are a perfect gift for Moms, Dads, grads—everyone. This is also a smart way to provide funds to the kids for use at this year’s Festival. BUY NOW and SAVE!! with Home & School gift card sales at the Grade School on Friday mornings. $12.00—20% OFF the price at the Festival ($15.00). Festival Admission Policy: Under age 14: FREE (if accompanied by a parent or guardian age 18 or older); $5 daily ages 14-61; Over age 61: FREE. 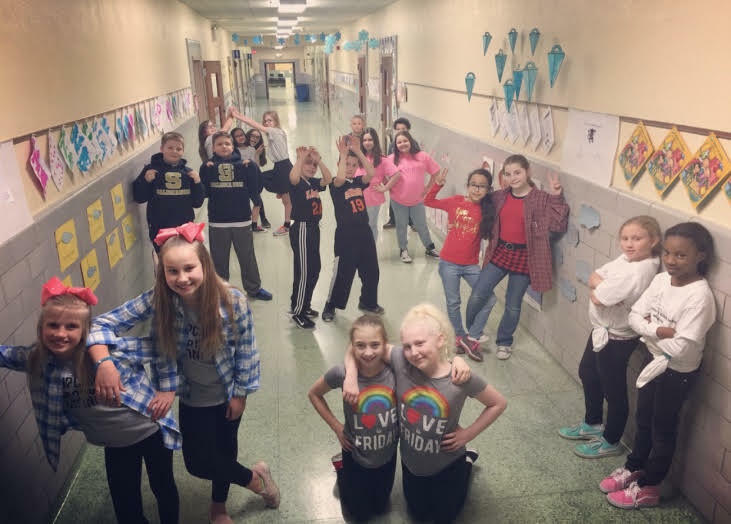 May 15th – Student Council Meeting – Preschool Room – 3:00-3:30 P.M.
May 16th – Band Concert – Ballad Room – 2:00 – 2:45 P.M.
Home and School Meeting/Elections/Social – Ballad Room – 6:30 P.M.
May 18th – 1st Grade Field Trip – Philadelphia Zoo – 8:30 A.M. – 2:30 P.M.
5th Grade Field Trip – Philadelphia Museum of Art – 9:15 A.M. – 2:00 P.M.
May 20th – Student Achievement Banquet – Padua Academy – 6:00 – 9:00 P.M.
May 22nd – Barnes & Noble Night – Concord Pike – 4:00-7:00 P.M.
8th Grade Graduation – Church – 7:00 P.M. Closing Mass – 9:30 A.M. Happy Spring! During this busy Easter season, we are sharing and teaching about Jesus’s resurrection with the children, discussing new life in nature and in religion, acknowledging Earth Day and the stewardship God has entrusted us with for the Earth, and preparing for the Sacrament of First Holy Eucharist. We are also teaching and celebrating the Fruit of the Spirit, “Gentleness” this month. During the month of May, we will teach “self-control,” a very timely topic for the end of the school year. The school was closed from April 13th – April 23rd for Easter Break. During this time we had several calls from potential new students for tours and shadow days. We invite students to “shadow”, very similar to the process in high schools where a shadowing student attends school with their potential classmates, goes through the schedule of a typical school day, join their peers for lunch and recess, and gets to see the school in a normal day of operation. Parents and students have given us great feedback on this opportunity and the fact that we accommodate any family schedule for personal tours. Our Student Council officers have done an excellent job giving school tours to potential families. Rice Bowls – Please remember to send in any remaining rice bowls for the Missions. We appreciate the generosity of all those who have sent the bowls in to date. Student Update – We visited Nick Mercantini this week. I am trying to stop by at least once a month with a few of his classmates. He enjoys the company and the break from the hospital monotony. He continues to make progress in therapies and still resides at A.I DuPont Hospital for Children. Staff Updates – All full-time staff are back to work and feeling healthy. Please keep Kathy Potts’s sister and Joanne Waritz’s brother in your prayers. Both are battling cancer at this time. Congratulations to 8th Grader Javier Lorenzo! – Javier set a record with his regional award every year since fifth grade. Competition is at the seventh and eighth grade level! This year he placed first in Region 3. He is a very quiet and humble student. High School Scholarships Announcements – Congratulations to the following 8th Graders who received scholarships to one of our Catholic high schools! Padua Leadership Conference – On April 1st, a group of our 8th Grade girls went to Padua to attend a leadership conference focused on gratitude. The girls enjoyed their day. Mr. Shields attended with them. Holy Eucharist– Please join our school and parish next Saturday, May 6th, as our 2nd graders receive the Sacrament of Holy Eucharist for the first time. They are very excited and have been practicing for this holy and happy event. School Emergency Drills – Each month we have a regularly scheduled fire drill. In addition to this monthly drill, we also practice an emergency drill. We have a simple Crisis Plan that is easy for 3-14 year olds to understand. Code Red is a lockdown (children know that this means stop). Teachers lock the classroom doors and keep children out of the line of vision and quiet. Code Yellow is basically a yield. Teachers call anyone from the hallway back into the classroom. Doors remain unlocked and children proceed inside their classrooms. Code Green is an evacuation. Students know to exit the building, similarly to what is done in a fire drill. Teachers use walky-talkies to communicate their locations with me in the main office. This is helpful if we were to have a power outage and could not use the intercom system. I am always impressed with the students’ cooperation with these drills. We are able to evacuate the building in an average of 1 minute and 25 seconds. Please talk with your students for more information. School Calendar for 2017-2018 – Our draft of the school calendar for the 2017-18 school year has been sent to the Diocese for approval. I will release it to parents as soon as possible. For purposes of planning, we will begin next year at the same time as all other schools in the Diocese, despite ending a full week earlier due to the festival. As explained before, in order to make up for those days we will be losing 3 days of our Easter break. At this point, it appears we will have 6 days off, Holy Thursday through Easter Tuesday. We will be in school the Wednesday through Friday of what would be the normal Easter break. Robots invade St. Anthony’s! – If you haven’t seen it yet on our Facebook page, we have purchased two mBots as a pilot program to test with one of our enrichment Math classes. During aftercare, students from all grade levels helped assemble these robots. They are currently being used in 6th Grade for purposes of students’ logical thinking and programming. For example, students are now programming the robots to navigate obstacle courses. They are enjoying this new advance in our technology. We plan to really expand this as we grow our library into a 21st Century Classroom. Applebee’s Spirit Night – Thank you for joining us for a good time at Applebee’s on Wednesday. This event ran all day and 10% of your check will be donated back to our school. These events typically raise between $300 -$400. Thank you to those who attended Bertucci night and Café Riviera/Café Napoli nights. From our Bertucci’s Spirit Night we raised $240. These social events are a nice way to meet other families in the school, enjoy some good food, and raise money for our school. We will have another one coming up soon with our Spring Book Sale at Barnes and Noble in May. Designer Bag Bingo – Thank you to all who attended and supported Home and School’s Designer Bag Bingo on April 23rd. It will clear over $2,000 when all bills are finalized! St. Francis de Sales Scholarship Convocation – On Monday, April 24th we hosted over 250 people here on our campus. 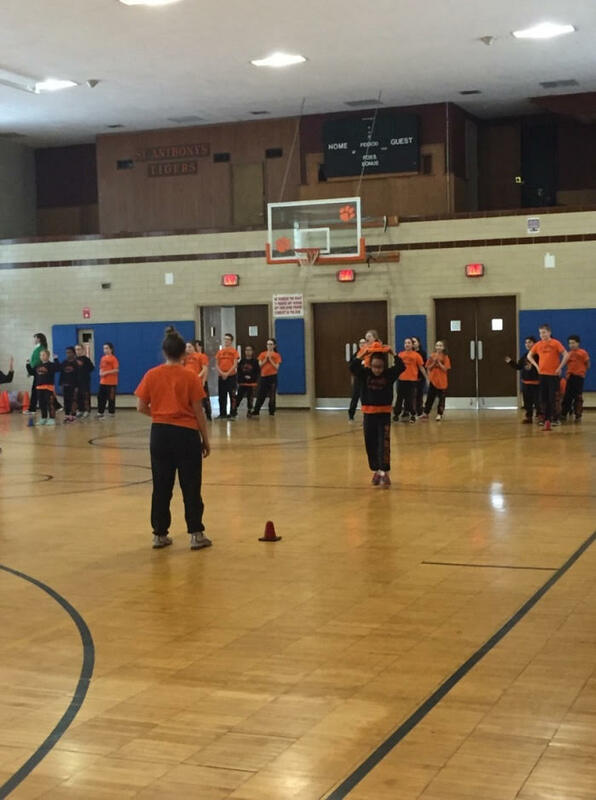 The high school students gathered in the school gym and practiced. The ceremony began at 7:00 P.M.in church, with Bishop Malooly celebrating. We served refreshments in the Ballad Room and received a lot of positive feedback from the Diocese for our hospitality. May Parish Monthly Socials -Please join us for the Parish Socials on Sunday, May 7th after the 9:00 A.M. and 11:00 A.M. Masses in the Ballad Room. Enjoy a variety of great food, including tomato pie and donuts from Serpe’s Bakery, breakfast pizza from Degnars’ Greenhill Deli, and other delicious food selections including mini-bagels and fresh fruit, while catching up with fellow parishioners and friends. Hope to see you there! ALL those bartending/working in bar areas need to be certified by the State’s Office of Alcoholic Beverage Control Commissioner (OABCC). This training is ONLY open to volunteers at the Italian Festival. Passes are a great gift for graduation or any occasion! Gift cards are a perfect gift for Moms, Dads, grads—everyone. Also, a smart way to provide funds to the kids for use at this year’s Festival. BUY NOW and SAVE!! 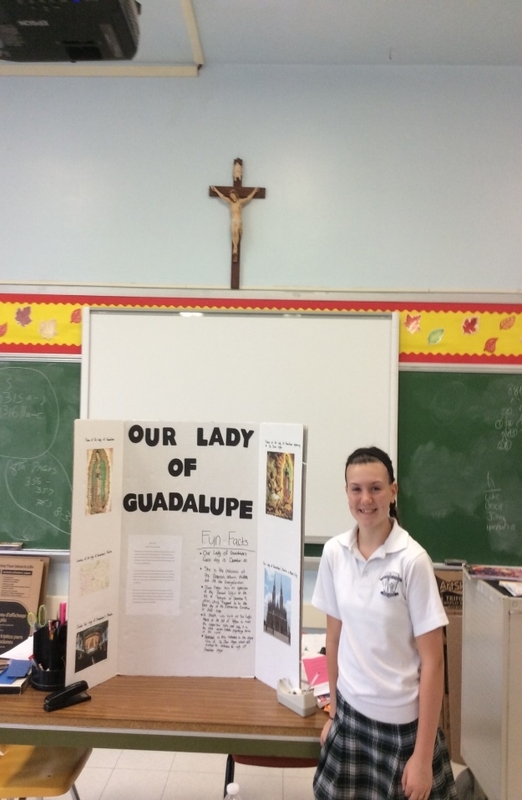 May 1st – Student Council Meeting – Preschool Room – 3:00-3:30 P.M.
May 3rd – 8th Grade Scholarship Convocation – St. Mary Magdalen – 6:30 P.M.
May 4th – Salesianum and Padua Visit – 6th/7th Grade – 9:00 -10:00 A.M.
May 6th – Celebration of First Holy Eucharist – Church – 10:00 A.M.
May 9th – May Procession Practice – 1:30 P.M.
May 10th – May Procession – Church – 2:00 P.M.
May Procession Practice – 9:00 A.M.
Barnes & Noble Night – Concord Pike – 4:00-7:00 P.M. Thank you for all you do to market our school. Whether it is word of mouth, social media, shared Facebook posts, or casual conversations with friends, you are our best marketers. We are growing and thriving, and we have big ideas for the upcoming school year. This is the time of year when we are watching our re-enrollment numbers and planning for new activities for the 2017-2018 school year. If you have not re-registered, please do so ASAP. Thank you to everyone who has already registered. We appreciate your timeliness, especially when it comes to the ordering of supplies and books. We plan to remove at least one textbook per year in middle school and replace them with E-Books for the iPad. We have big ideas for transforming our library into a 21st Century Classroom. We are looking at both student and teacher schedules to make sure the time spent here is as efficient and productive as it can possibly be. We are seeking grants to help with our wish lists. Thank you to our Special Education Teacher, Elise Schiccatano, our School Counselor, Mrs. Laura Angelo, and our Technology Coordinator, John McMillan for their innovative ideas and energy with regard to meeting the needs of all students, helping us fully live our mission, and making our school space “relevant” to next generation students. Thank you to Mr. Shields for his work in his new role as Parish Business Manager. He will continue to serve as Vice Principal, but his new role will include parish strategic planning, grant writing, fund development, and overseeing parish staff members. Fruit of the Holy Spirit – Join us in the month of April as we focus on the spirit of gentleness. “I, then, a prisoner for the Lord, urge you to live in a manner worthy of the call you have received, with all humility and gentleness, with patience, bearing with one another through love.” Whenever I think of gentleness, I can’t help but think of two of our patron saints, St. Francis de Sales and St. Francis of Assisi. I think of the wonderful Franciscan sisters that have truly been living saints in my life, Sister Margaret Cunniffe, Sister Jamesanne Taggart, and Sister George Mary Rhodes. I learned from them here at St. Anthony’s and they taught me in high school at Padua Academy with “softly but strongly” as our motto. These wonderful ladies I now am blessed to call family friends. I think of the Salesian priests that have been role models of gentle strength throughout all of my sacraments here at St. Anthony’s, into my college years at DeSales University, and in my marriage and family life. From Father Roberto Balducelli to Father Nick Waseline, our parish Pastors have gently, but firmly led the way. I pray for a call to religious vocations, because the gentle souls in my life have helped me in my faith formation and continue to guide my family and me in times of prayerful need. I want this for your children and for their children as well. When you need a Franciscan or Salesian, I can assure you they are your best prayer warriors! Let’s pray this month for more strong and gentle souls to hear the call to religious life and lovingly answer it. Antonians will sing this Sunday – This is a reminder to parents that the Antonians will sing this Sunday. It is also an invitation to encourage families to join us for Mass on Sundays and hear our children’s voices fill the church. There is nothing sweeter! We want to grow our student participation at Sunday Mass. I was recently told by a young child, “You take us on Fridays, so my parents don’t have to go on the weekends.” I have to say that made me a little sad. It was not the first time I have heard this same excuse. Second Trimester Honors Assembly – Please join us for Mass on Friday, April 7th at 8:00 A.M. Mass will be followed by a brief Honors Assembly for students earning academic honors in Grades 4 through 8. Special recognition will be given to students who have participated in school and diocesan academic competitions as well. St. Anthony’s Scholastic Book Fair – Next week will be our Spring Scholastic Book Fair! Teachers will select a class shopping time for the entire class to go shopping, but all are welcome to shop at the Book Fair! Hours during the school day – 8:00 A.M. – 2:00 P.M.
TerraNova Testing – Thank you to all of our parents for making TerraNova testing a priority last week. Children arrived at school on time, well fed, and ready to focus for the mornings. We also want to send a thank you to all the families who helped provide healthy snacks for the children last week. It is a long week of testing for them, and I know they enjoy those little extras in the morning. They did a great job! I look forward to seeing their results in May. Diocesan Pilgrimage – The Catholic Diocese of Wilmington CYM Pilgrimage “Love without Measure” takes place on Saturday, April 8th. This is an awesome way to enter into prayer for the start of Holy Week. Students throughout the Diocese of Wilmington will join together to pray and carry the Pilgrimage Cross through the city streets. This is beautiful to witness and truly touching to be a part of. Consider joining us in the spiritual journey! Phil Rendina Discretionary Dinner –Approximately 150 people attended this event. It was a nice evening of dinner, dancing, and casino tables. The event raised $6,300, but some donations are trickling in. They expect the final total to be $7,000.00. Thank you to all who attended! Congratulations to 5th grader Dylan Farrell. Dylan participated in the Honors Band Concert at Villanova University on Saturday, March 18th. Great job, Dylan! Congratulations to our Declamation Team! At the Ursuline Academy Forensic Competition, our 4 students who competed each won an individual trophy. They also took home the First Place school team award. Congratulations to Paige Johnson (8th), Henry Kelleher (7th), Emily Anderson (6th), and Neha George (6th)! You made us all very proud! Bertucci’s Night – Thank you to all those families who enjoyed a night out at Bertucci’s last week! Both locations saw a good turnout. Thank you for supporting our school through these events! 8th Grade Lenten Pasta Dinner is TONIGHT, Friday March 31st – A flyer was sent home. Please join us to help the 8th grade class raise money toward their class Trip to New York City in May. Our students are looking forward to cooking and serving you! Kindergarten Pizza Party – Kindergarten had a pizza party today courtesy of Student Council. This was in recognition of their highest contributions to the canned goods food drive for the St. Patrick’s Center. Great job, Kindergarten! Paint Night – We did something different for one of our faculty meetings. We did “Painting with a Twist” for our staff. All were invited, and 21 attended. I have to tell you that I laughed the entire time. I would have loved for your students to see which teacher could not keep up, who had to have directions repeated multiple times, who was a perfectionist, who was creative, and who was critical of themselves. It was a riot! I may save these “beautiful” pieces of art for you to admire during our Excellence Fair in May. We celebrated our lovely Mrs. Nancy Burris’s birthday that night. We ate cake, shared snacks, and had a really fun time. Alumni News – Congratulations to the following graduates of St. Anthony’s who received honors from Padua Academy during the second trimester. First Honors: Grace McCarthy (12th), Robin Land (9th), Andrea Reynolds (10th), Reagan Widmaier (9th). Second Honors: Margaret Banker (12th), Kayla Godlewski (12th), Laura Land (12th), Madeline Perez (12th), Ellen Banker (11th), Stefania Lombardo (11th), Christina Molloy (11th), Mackenzie McCall (10th), Caroline Achenbach (9th), and Marissa McCarrick (9th). Way to go, ladies! Saturday, April 8 from 4:00 to 5:15 P.M. Masses: 7:00 A.M., 9:00 A.M., and 11:00 A.M.
Daily Masses: 6:45 A.M. and 8:00 A.M.
Adoration at the Altar of Repose 7:00 – 10:00 P.M.
Church open for prayer & reflection – 12:00 P.M. to 3:00 P.M.
Gesù Cristo Morto Procession: 8:30 P.M. Passes are a great gift for graduation or any occasion! Gift cards are a perfect gift for Moms, Dads, grads—everyone. Also a smart way to provide funds to the kids for use at this year’s Festival. BUY NOW and SAVE!! April 24th – St. Mark’s Spring Visit to 6th and 7th Grade – 1:30 P.M.
April 25th – Kindergarten Field Trip – Wilmington Playhouse – 9:00 – 11:00 A.M.
April 27th – Uniforms Orders – School Lobby – 8:00 A.M. Check out our new school video tour on Facebook and the website! or check us out on Facebook at St. Anthony of Padua Grade School Families, Alumni & Friends. This was our first video tour attempt. Thank you to Mr. John McMillan and Mrs. Laura Angelo for their assistance. Thank you to Ms. Cripps for her help putting together Tiger Talk every two weeks! I will be giving her a tiny break due to our Easter Break. We will resume Tiger Talk after the break. Please check the school website calendar regularly. It is updated daily with any change or addition. We wish everyone a blessed and very Happy Easter! Please keep Father Nick and Nick Mercantini in your family’s prayers. During the month of March, we will be talking to the children about “Faithfulness,” this month’s Fruit of the Spirit. “God is faithful, and by him you were called to fellowship with his Son, Jesus Christ our Lord.” (1Corinthians 1:9) We often pray our Diocesan theme prayer to the Holy Spirit, “Come Holy Spirit, fill the hearts of your faithful and kindle in them the fire of your love. Send forth your Spirit, and they shall be created. And You shall renew the face of the earth. O, God, who by the light of the Holy Spirit, did instruct the hearts of the faithful, grant that by the same Holy Spirit we may be truly wise and ever enjoy His consolations. Through Christ Our Lord. Amen.” This prayer helps to remind us to keep faithful to the beliefs we have and to allow God to guide us on our path. Our Lenten theme, “Pray and Give” continues over the 40 days of Lent. Thank you to those who donated food for the St. Patrick’s Center. Today was our deadline. I look forward to sharing the news of the class with the highest contribution. Although we really should not encourage competition when donating, it surely does motivate our students. Please encourage your students to continue giving to their rice bowls and also on Monday when we hold a dress down day for Nick Mercantini and his family. Congratulations to our February students of the month! February’s fruit of the Holy Spirit was generosity. These students are generous with their time and talents to their classmates and teachers. 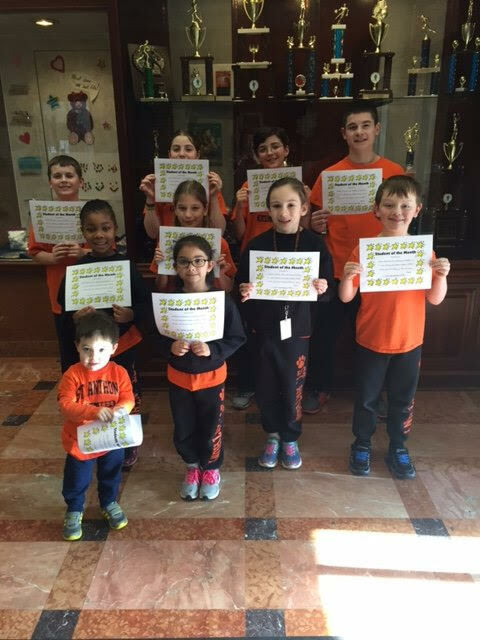 Congratulations to Abigail Mahon (PreK 3), Maria Bartlett (PreK 4), Hayden Williams (K), Brenan Truver (1st), Jacob Matarese (2nd), Sean McGuigan (3rd), Alessandra Marte (4th), Madeleine Lawrence (5th), Makenna Sarver (6th), Madison Rieger (7th), and Luke Swift (8th). Great job! 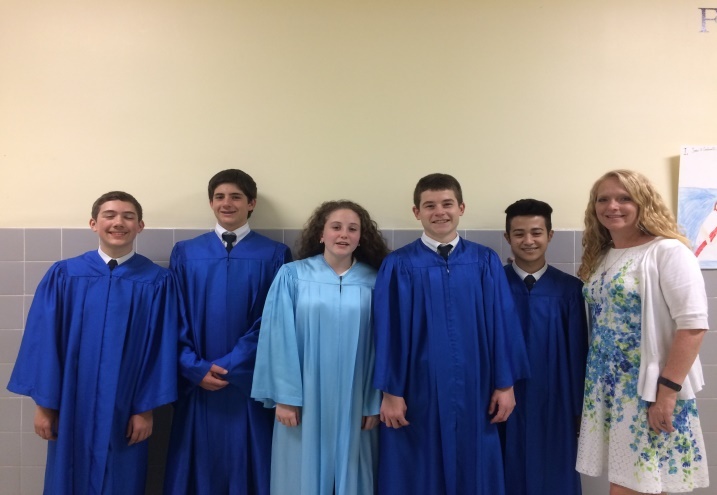 Antonians Reminder – This Sunday, March 5th, the Antonians will be singing at the 9:00 A.M. Mass. Antonians, please make an effort to attend this Mass to sing for our parish. Thank you. 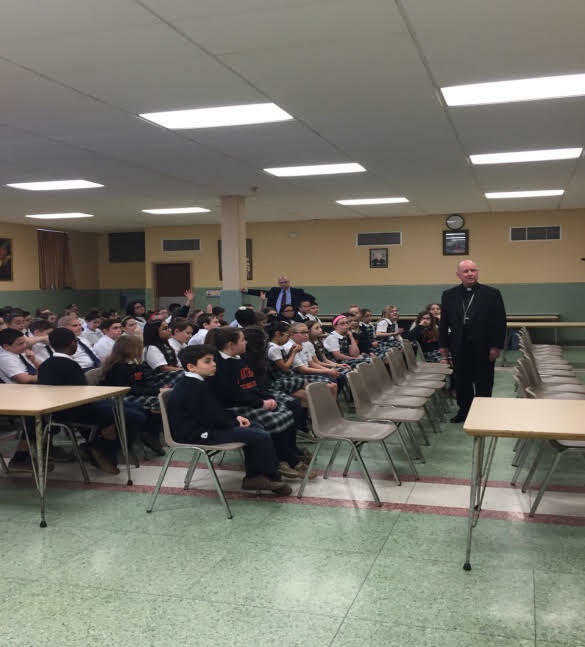 Bishop’s Visit – Yesterday, we had a wonderful visit with Bishop Malooly and superintendent, Dr. Louis DeAngelo. 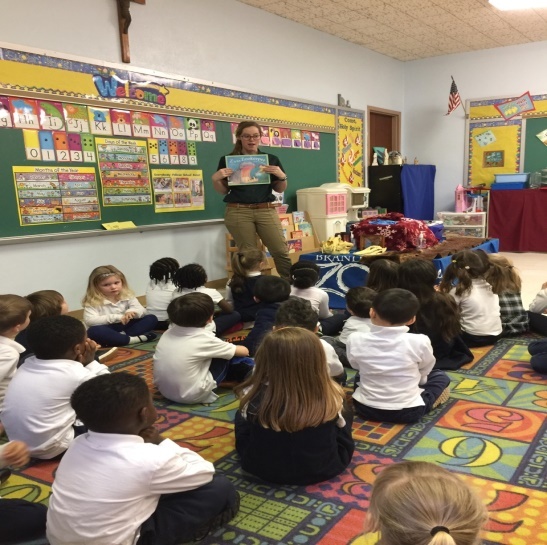 They first visited with Preschool through 3rd Grade in the Ballad Room, where they discussed what they were learning in school, Lent, and our Diocesan theme “Come, Holy Spirit.” The students sang a Fruits of the Holy Spirit song they had learned with Mr. Colligan, which the Bishop enjoyed hearing. 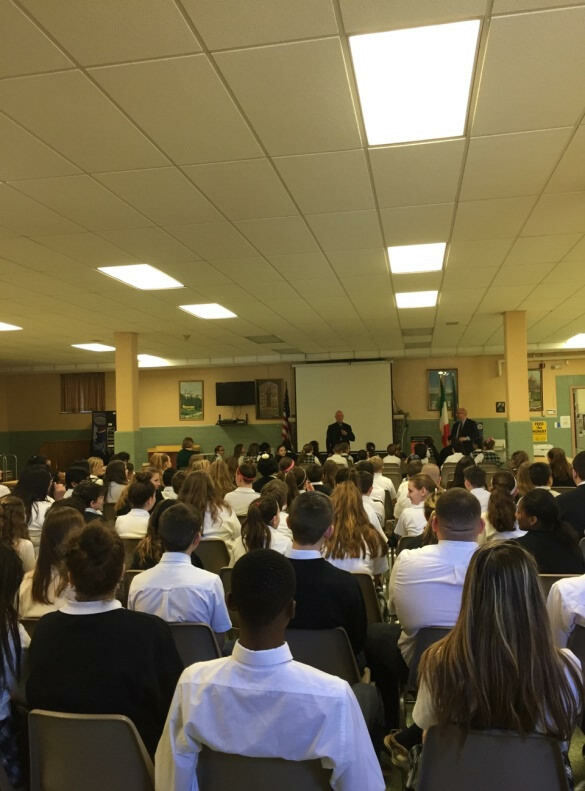 Next, Bishop Malooly met with 4th through 8th Grade. All students came in and shook the Bishop’s hand and discussed the Diocesan theme, Lent, and what they were learning in classes, focusing on Black History Month and their Religion class. 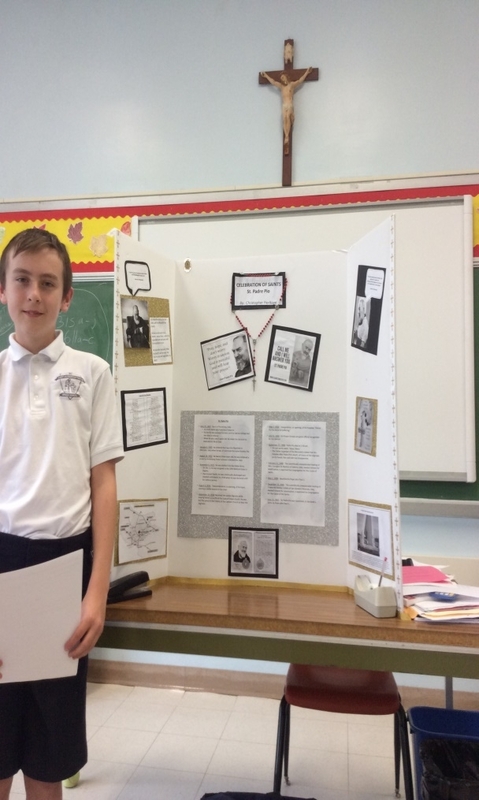 The students did an excellent job discussing what they had covered in Religion class, ranging from the Beatitudes, types of prayers, and the disciples, as well as telling the Bishop about all the famous African-Americans they have learned about. Congratulations to the following students who have qualified to represent St. Anthony’s at the Knights of Columbus Free Throw Finals on Sunday, March 19th at 1:00 P.M. in the St. Peter’s New Castle Gym. Good luck! Terra Nova Testing – On March 20th, we begin Terra Nova testing for 1st through 8th Grades. These days are very long for the students. Please make sure your child gets to school on time because testing starts first thing in the morning. Students should bring in extra number 2 pencils, an eraser, a water bottle, and healthy snack to help them during the day. Yoga Class – For those who signed up for yoga classes with Michelle Pedicone, the classes will be held in the library and will end at 4:30 P.M. The classes will take place on the following days: March 6th, March 20th, April 3rd, April 17th, May 1st, and May 15th (final session). Art Club – For those enrolled in Art Club with Mrs. Everman and Mrs. DelGrosso, the classes will be held in the Art room and will run from 3:00 – 4:00 P.M. Art Club will take place on the following days: March 1st, March 14th, March 29th, April 11th, April 26th, and May 10th (final session). If your students are registered for Yoga or Art Club, please mark your calendars for the above dates, as there will not be reminders sent each week. Thank you! During last week’s warm weather, many of our students and teachers took the opportunity to get outside and enjoy the lovely temperatures before the cold weather came back. 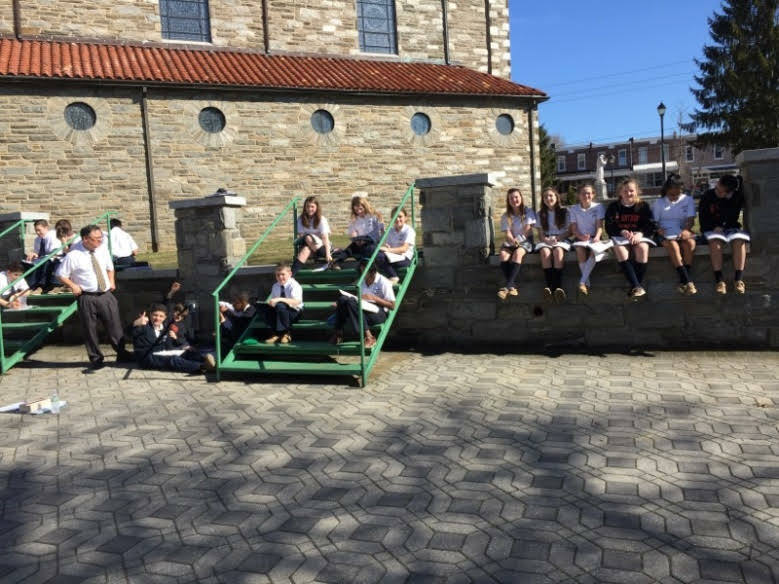 Below is the 6th Grade enjoying Religion class outside. Financial Aid for the 2017-2018 School Year – Financial aid packets are now available in the main office. A parent must come into the school office to sign out a packet. Students may not bring them home. All parents applying for financial aid to our school MUST apply to the Diocese first. This is a new policy. 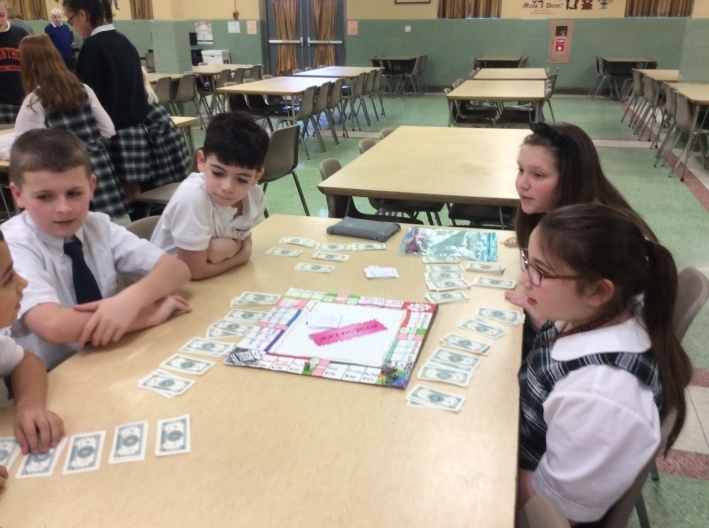 Please be aware that without a completed application to the Diocese, a family will not be considered for financial aid through our parish education fund. This is a new policy. Please contact Mr. Shields or Mrs. Serio with any questions. *Reminder – Financial aid packets have to be completed and submitted by March 6th. Monthly Social – Please join us for the parish socials on Sunday, March 12th (Second Sunday of March), after the 9:00 A.M. and 11:00 A.M. Masses in the Ballad Room of the Grade School. Enjoy a variety of great food, including tomato pie & donuts from Serpe’s Bakery, breakfast pizza from Degnar’s Greenhill Deli, and other delicious food selections including mini-bagels & fresh fruit while catching up with fellow parishioners and friends. Hope to see you there! 2017-2018 Tuition Statements – For those families that have returned their Reregistration forms for next school year, you will be receiving an Agreement Confirmation Notice from FACTs. Please note that this may not be your final payment schedule. Credits for Financial Aid, Home and School Scrip Program, and Parish Offertory will be applied to your account at the end of May/beginning of June. If you have any questions, please contact Lisa Serio at Lserio@stanthonynet.org or 302-421-3707.
) for upcoming events and information. March 6th – Student Council Meeting – PreSchool – 3:00-3:30 P.M. Confirmation Registration – Ballad Room – 6:15 P.M.
Home and School General Meeting – Ballad Room – 6:30 P.M.
March 9th – 5th Grade Field Trip – Constitution Center – 9:15 A.M. – 1:45 P.M.
March 10th – Stations of the Cross – Church – 2:00 P.M.
March 11th – It’s Academic – St. Anthony’s – 9:00 A.M. – 3:00 P.M.
March 13th – First Eucharist Meeting – Ballad Room – 6:15 P.M.
An Evening of Sacred Music – St. John the Beloved – 6:30 P.M.
March 17th – Stations of the Cross – Church – 2:00 P.M. Generosity is our Fruit of the Spirit for the month of February. “You are being enriched in every way for all generosity, which through us produces thanksgiving to God.” (Corinthians 9:11) This is one fruit that I see practiced so often in this parish school. Our staff reflection for this month gave us an opportunity to share what our experience in the ministry of Catholic education has taught us about generosity. Teachers shared that the spirit of generosity is shown most often in our students. They are generous with their time, attention, help, and resources. When asked to recall a time when we were the surprised recipient of unbounded generosity, teachers again mentioned our students. I found it interesting as they shared stories of your children. We could learn a lot from these young, loving, and giving children. You may not see this same generosity and helpfulness around your own homes, but I want you to know it is there and abounding. Our Lenten theme for this year is simply, “Pray and give!” This theme is easy for all students to understand. We have been praying daily for the healing of our pastor, Father Nick. We have been praying for the healing of many people in our parish and school communities in need of God’s grace and mercy. We will have this continue to be our focus during Lent. We will also be working on giving to those less fortunate than us. We will be holding a food drive for the St. Patrick’s Society in the upcoming weeks. A flyer will be sent home soon. We also continue to encourage the children to give their spare change during Lent, using the rice bowls that will be sent home next week. Our families are extremely generous. I want to thank everyone for their contributions for dress down days. We decided a few years ago that all dress down donations would go directly to the Missions. This year, we received notification that we won First Place in Total Contribution and also First Place Per Capita. On March 5th, Mr. Shields and I will join a few of our students and attend the Mass and breakfast at St. Helena’s in recognition of the Missionary Childhood Association. The students will be recognized by Dr. DeAngelo and Bishop Malooly. I am very proud of our students. They give often, without hesitation or in expectation of recognition. My staff and I have been substituting often lately, and I want to thank each and every teacher that has been so “generous” and flexible with their planning periods. 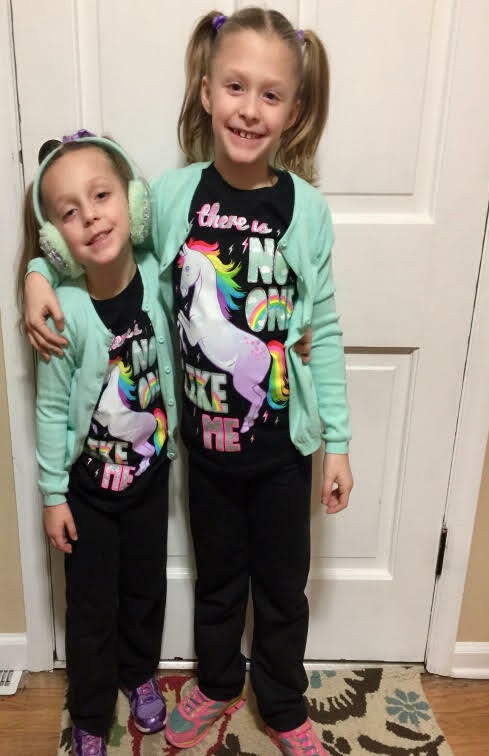 In an effort to keep substitute costs down and to keep consistency with implementing lesson plans, everyone has stepped up to the plate and helped cover Mrs. Potts, Mrs. O’Brien, and other teachers that have been out sick recently. Middle school teachers have gotten to experience the joy (and controlled chaos) associated with teaching the primary grades. And primary teachers have experienced teaching middle school, where you don’t typically have to explain everything three times. It has been enlightening to all and a true help to Mr. Shields and me. I want to personally thank everyone for their kindness and generosity. Our students are not the only ones who are beautifully living the Fruits of the Holy Spirit. Thank you to my amazing staff! 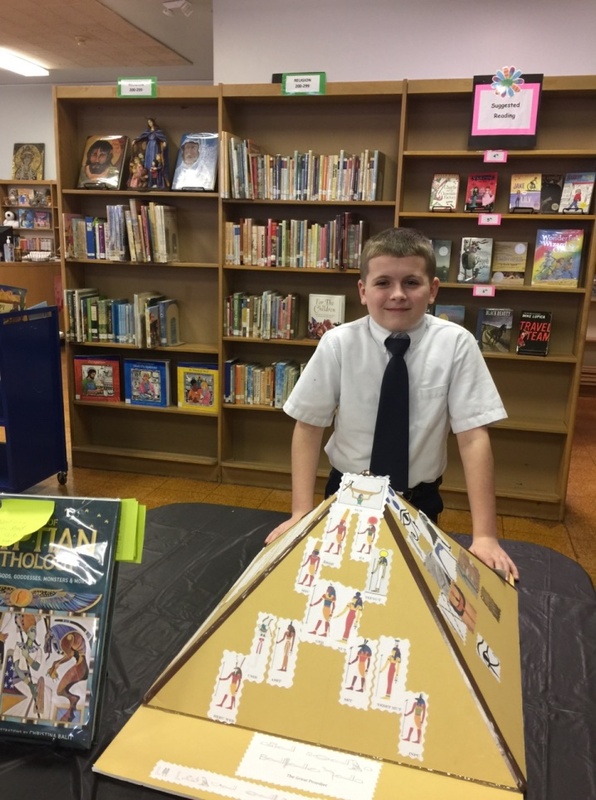 I had the pleasure of observing 6th Grade Egyptian projects this week and 6th Grade playing Math games they created for their 3rd Grade church buddies. I celebrated Valentine’s Day with our loving Preschool class and then returned to Preschool on Thursday for the Brandywine Zoo visit. Yesterday was our Spelling Bee. I was amazed by the difficult words used in this year’s Spelling Bee and impressed by 8th Grade students’ ability to spell some of the words. When we held the 8th Grade classroom Spelling Bee, I told them I had never used a few of those words in a sentence in my life. They kindly corrected me when I pronounced one word incorrectly. Thanks again to our Home and School Board for all of the events they are planning for the remainder of the year. Stay tuned for flyers and additional information. We have Grotto Night coming soon (on Ash Wednesday) and Spring Fling, to name only two. Lunch Ordering Reminder – I want to clarify some things about our lunch procedure. We typically only have one person serving and one as the cashier. This is absolutely fine when all things flow smoothly and parents follow the ordering process. This is a reminder that the process for ordering lunch is to use the menu provided to all families. We are having issues with a few students not filling out the menu and then charging regularly. The purpose of the menu is for ordering and preparing food with very little waste. The second purpose is to be sure you are aware and in control of what your children are eating. We do not make a lot of extra food, so if your child forgets his/her lunch or decides to order, they may not be able to get what they want due to the supply of what is available (based on the amount prepared according to the menu). Once lunch begins, there is no time to prepare additional food. Three lunches run consecutively. If your child does not use the menu and you simply send in cash, there is no guarantee the child will choose healthy food. I assure you that they typically buy a hot dog and several snacks instead. However, with a lunch menu, the adult in the cafeteria sees each menu and you are assured your children are getting the warm meal you selected. Children who use the menu are the first to enter the cafeteria, to keep the pace moving. If your child has to charge or has cash for snacks, they are called last. This is simply efficient. Charging requires a stop of the line and paperwork to be filled out. We do not do this in the middle of each class. The cafeteria is a huge financial loss to the school every month. It is not set up to be a fundraiser in any way. Therefore, we really need everyone’s cooperation to make it a success. Children are served a hot lunch for less than $4 which is very reasonable. Please be sure to use the lunch menu (and attach payment) for your child to order lunch for the month. If your child charges for some reason, please be sure to send in the money the next day. Charges really should be very rare. Thank you! 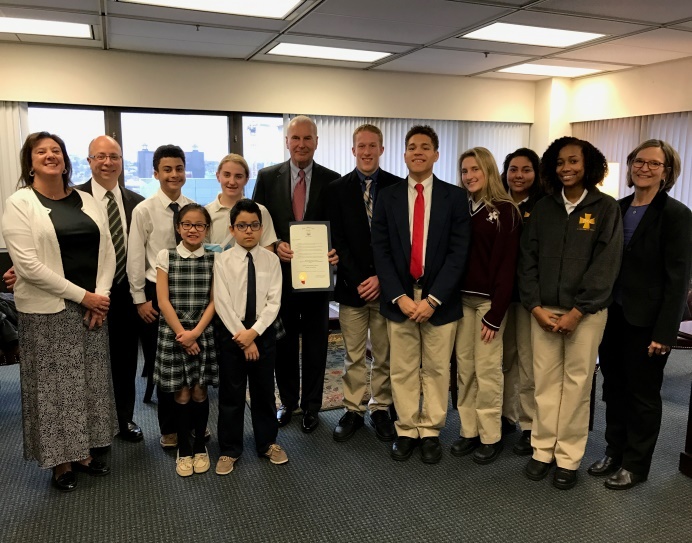 Visit to the Mayor’s Office – On the Wednesday of Catholic Schools Week, some of our students went to visit the Mayor of Wilmington, Michael Purzycki, in celebration of Catholic schools in the Diocese of Wilmington. Spelling Bee – Congratulations to our classroom Spelling Bee winners: Nora Farrell (1st), Lillian Scott (2nd), Lena Padovani (3rd), Andres Lorenzo (4th), Diana Lorenzo (5th), Neha George (6th), Hayden Scully (7th), and Paige Johnson (8th). It was obvious that all of these students had studied hard for the school Spelling Bee. After many rounds, our school winner was Paige Johnson. Way to go, Spellers! 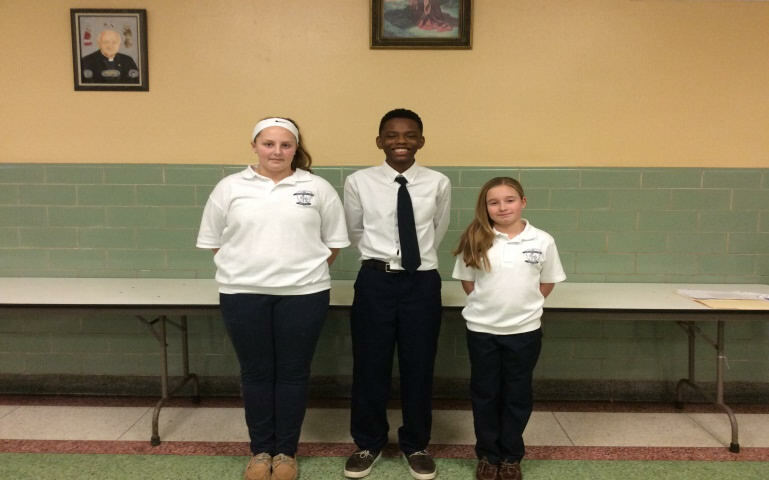 Declamation – Neha George, Henry Kelleher, and Paige Johnson recently competed at St. Mark’s in a Declamation contest. Paige came in 1st in the 7th/8th Grade Oral Interpretation. All three did an excellent job! Congratulations! Math League – Congratulations to 8th Grader Javier Lorenzo. Javier tied for 1st Place in Math League Region 3. Way to go, Javier! Save the date for April 4th – 8th Grade parents will be sponsoring an all-day dine-in or takeout fundraiser at both Cafe Napoli and Cafe Riviera. Both events will be held on April 4th. Proceeds will help offset some of the costs associated with the 8th Grade trip to New York City. Thank you once again to our generous Home and School Board for also making a contribution of $500 to the 8th Grade class. Rocky’s Reading Challenge – Preschool through 3rd Grade will be participating in the Rocky’s Reading Challenge to earn tickets to a Blue Rocks game. Look for more details in the paperwork that came home this week. If your students are registered for Yoga or Art Clubs, please mark your calendars for the above dates, as there will not be reminders sent each week. Thank you! 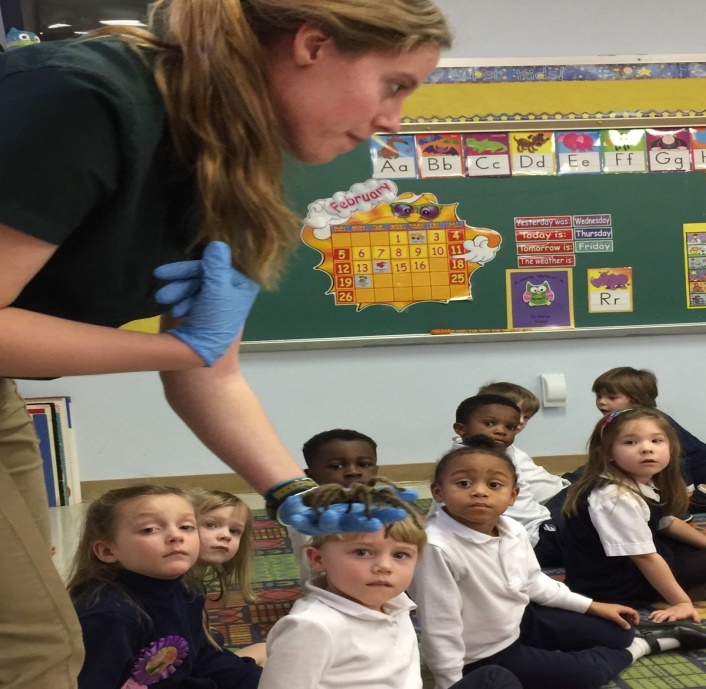 PreSchool 3 and 4 had a fun visit with the Brandywine Zoo! With the help of Ms. Hannah, the Zookeeper, we met Fiona the rose haired tarantula, S.J the arboreal lizard, Reggie the Brazilian Rainbow Boa, and Martha the ferret! 1st Grade had a wonderful time on their field trip to see The Lion King, Jr. at Cab Calloway. The children did an awesome job on their 100th Day of School Projects. 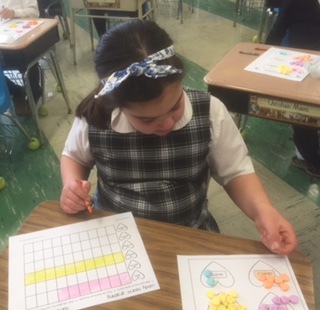 They also enjoyed a special Valentine’s Math Activity where they were able to sort and graph candy hearts. 2nd Grade is working on two-digit subtraction. They are reading and learning about Black History, as well as the presidents. 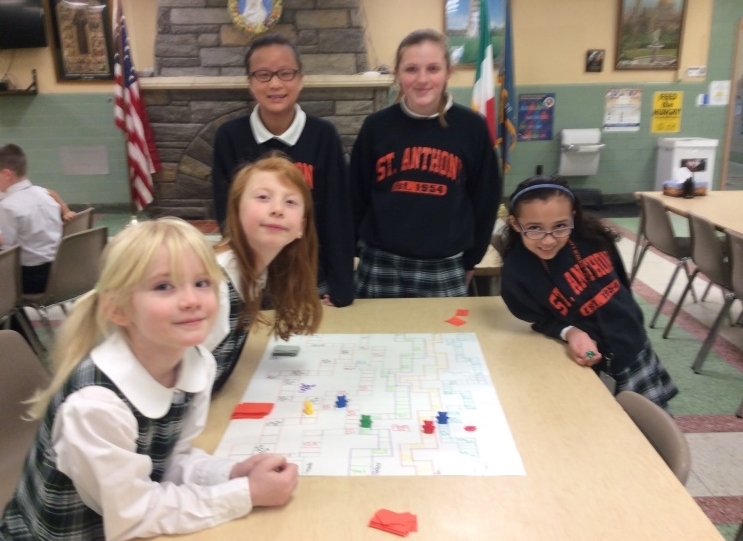 3rd Grade played Math games that their 6th Grade buddies created for them. The students had a great time playing these well thought out games! 4th Grade has been working hard on learning how to divide 2 and 3 digit numbers by 1 number. They’ve also been learning about chemistry – they combined vinegar and baking soda and were amazed by the chemical reaction. 5th Grade has been busy working on a world travel project. Students were able to pick any destination they wanted to travel to and then created a poster that included interesting facts, day and night photos, and other tidbits they learned while researching. 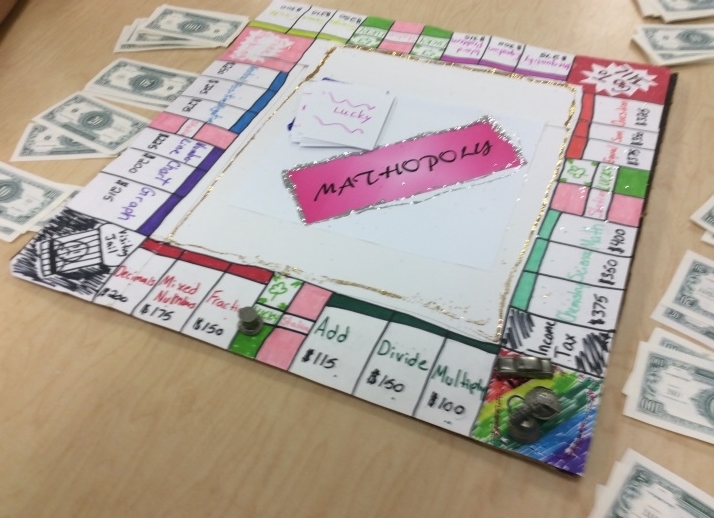 6th Grade has been very busy making Math games (see above) and completing their Egyptian projects. 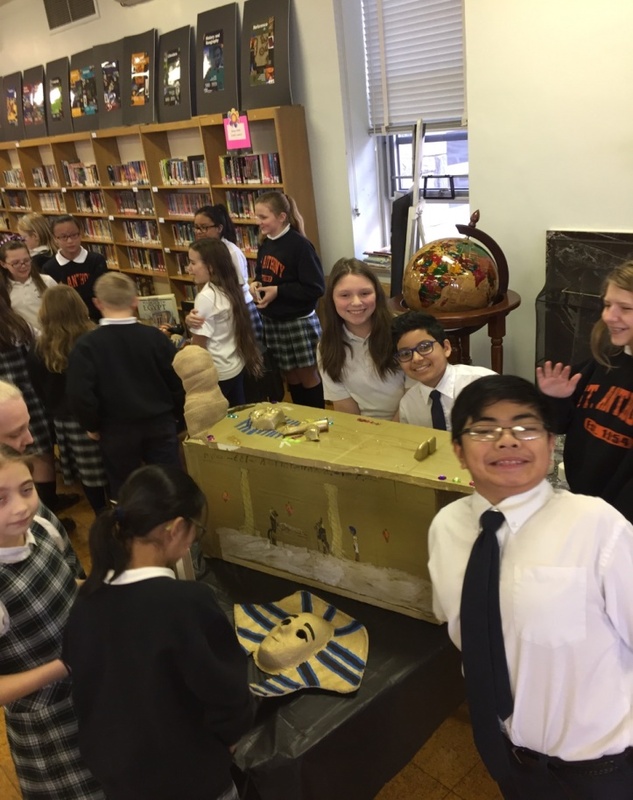 All students acted as docents when other classes came to visit the Egypt Museum set up in the Library. The students did an excellent job on the projects and research. 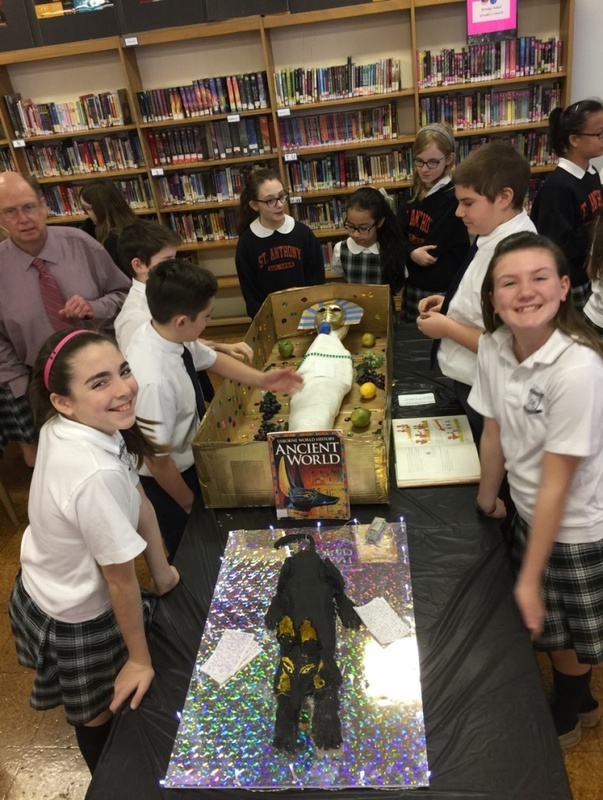 Middle School – All Middle School Science classes have been sharing their mid-year projects. 6th Grade presented projects on Body Systems, 7th Grade made 3D cells, and 8th Grade taught their classmates about sound waves and pressure. 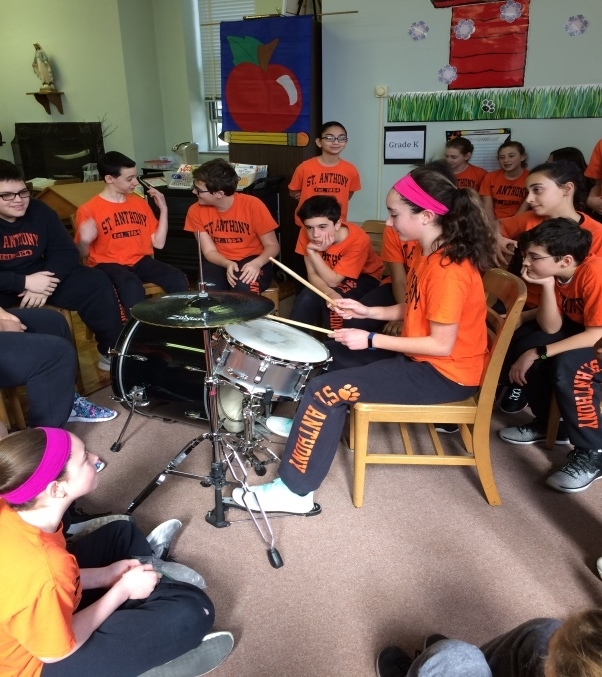 In Music class, 5th – 8th Grades are learning about the coordination needed to play drums. Tuition Payment Dates – Occasionally a family may need to adjust a tuition payment date. This is to inform you that the Business Office will need a minimum of 3 business days’ notice to change that date. If you should need a date changed please contact Lisa via email at lserio@stanthonynet.org or at 302-421-3707. February 26th – Boy Scouts’ Pancake Breakfast – Ballad Room – 6:00 A.M. – 2:00 P.M.
Grotto’s Night –Pennsylvania Avenue– 4:00 – 9:00 P.M. This week has been a very exciting week for our school and Catholic schools across the country as we celebrate Catholic Schools Week. 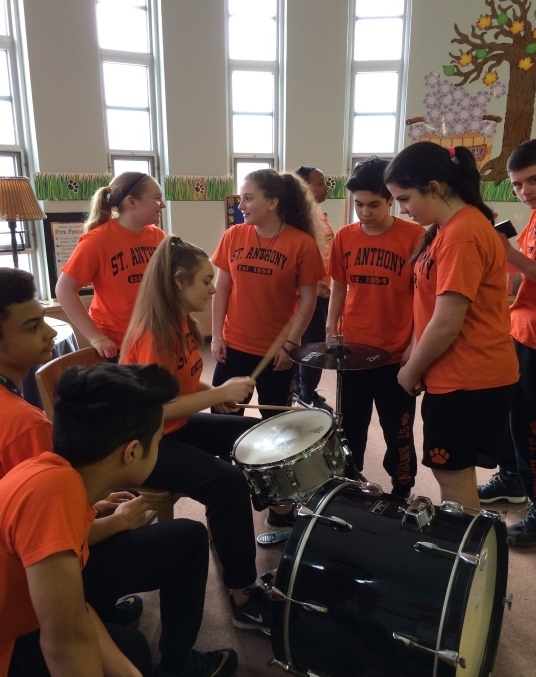 The theme for Catholic Schools Week is “Catholic Schools: Communities of Faith, Knowledge, and Service.” These 3 words are important to every Catholic school and here at St. Anthony’s we try (and succeed) to live up to them. When a new family comes to tour the school or a new student starts, a consistent comment made is the sense of belonging and family they feel here. The teachers and staff work hard to make sure all students are learning and succeeding at their level in the classroom. Service is something we are working on here whether it is activities like drawing pictures and cards for people in nursing homes, or having dress down days to benefit the Childhood Missions. We will continue to strive to be a Community of Faith, Knowledge, and Service. Part of the fun for the students comes from the different events and activities that happened this week. Sunday was the beginning of Catholic Schools Week. We began the week with Father Nick celebrating our Catholic Schools Week Mass. After Mass, some families remained and prayed the Rosary together for Father’s healing. For those of you unaware of Father Nick’s recent diagnosis, his letter to the parish is attached. We continue to pray daily as a school family for his healing. It was a blessing to have him open Catholic Schools Week for us. Monday was Teacher Appreciation Day and silly sock/crazy hat day. Our generous Home and School Board provided a delicious lunch for our faculty and staff on this day while Student Council provided breakfast. Many of our students and staff participated in the theme of the day by wearing their silly socks and crazy hats. 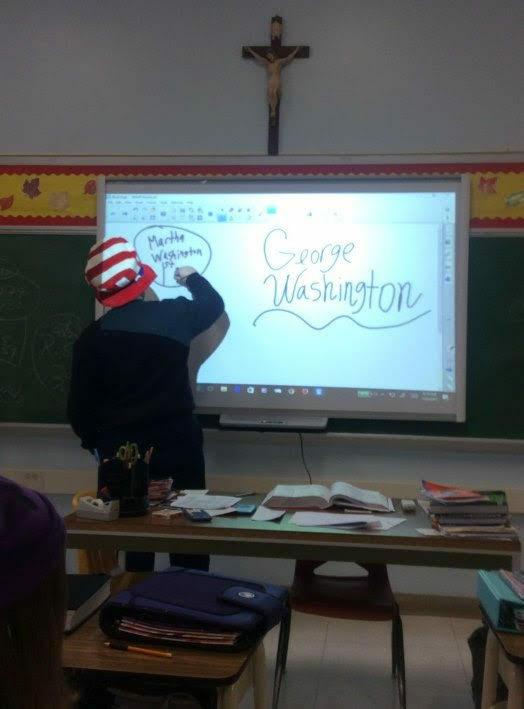 Below are pictures of Max DiOssi and Donovan Sarver presenting “Washington leads a New Nation” in Social Studies while wearing their hats. Tuesday was Twin Day and Knowledge Bowl. Not only did we have twins, we also had triplets and quadruplets. It was amazing to see the lengths our students went to so they could match with their “twin.” Our students did a great job participating in the Knowledge Bowl. I heard rumors that many of our parents were impressed with the information the students had mastered at such young ages. Thursday was Student Appreciation Day. Thank you to our Home and School Board for also generously funding our newest idea of a school-wide movie day. The students (all 233) were angels on this trip. 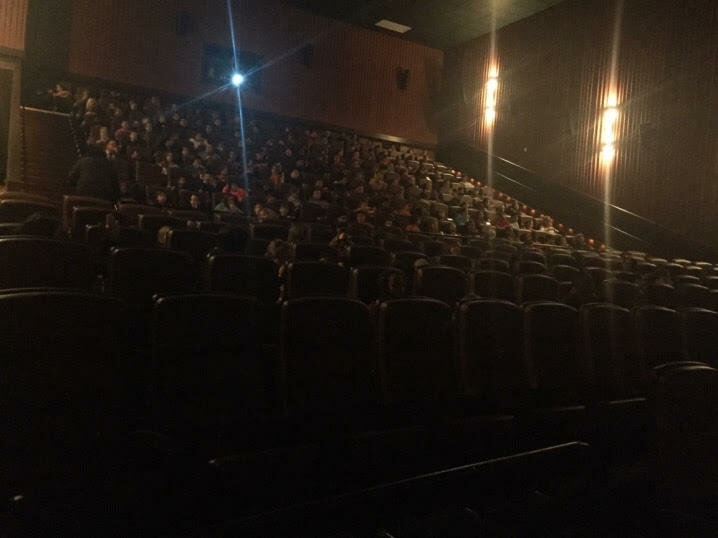 They sat with their church buddies in the theatre, had a great time, and really enjoyed watching “Sing” and eating snacks as a school. The response we had from the students was very positive. We received every permission slip back for that field trip. Let’s see if we can have the same response to our 2017-2018 re-registration forms! Hint! Hint! Friday, we celebrated Mass as a school community. At Mass, we celebrated the Feast of St. Blaise. Father Nick blessed the throats of over 300 people. He blessed our staff, students, parents and visitors at our 8:00 A.M. Mass. Father Nick told us the meaning of this was for the Lord to bless them and protect them from serious illnesses, particularly of the throat, nose, and ears. He reminded them of the lesson that the blessing may not prevent colds or flu, but if they do get sick, it is a reminder that God will be with them and protect them. He told the old story of the little boy who was choking after swallowing a fish bone. The fish bone came free when St. Blaise prayed over the boy’s throat. Red ribbons around the candles are a symbol of the blood shed by St. Blaise for Jesus and his beliefs. To explain why we use candles, he said there is a legend about St. Blaise, sitting in jail (for his religious beliefs) and while in jail, he was in complete darkness until a friend brought candles to light his way. The candles are a symbol of her charitable deed. This afternoon, the Class of 2017 competes against their parents in the annual 8th Grade versus Staff/Parents volleyball game. We will let you know how that turns out in our next communication. I am told that several parents are attending. However, our 8th grade is very confident. Congratulations to the following students for winning the Knights of Columbus Vocation Essay contest! 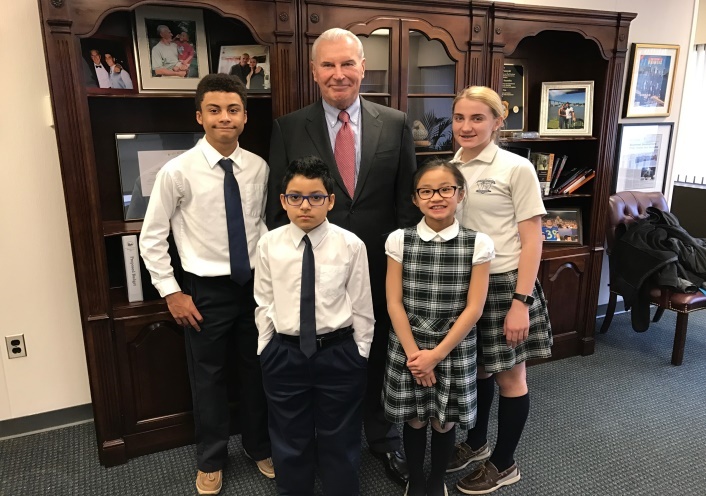 The winners are in 5th Grade – Arianna Marchione, 6th Grade – Amanda DeFrehn, 7th Grade – Hannah Fagioli, and 8th Grade – Connor Dagge. Congratulations to the winners of the Patriots Pen essay contest! First place went to Hannah Fagioli, second place to Amari Mathis, and third to Madison Rieger. Congratulations to our January students of the month! January’s Fruit of the Spirit was Kindness. These students exhibit kindness to everyone they meet. 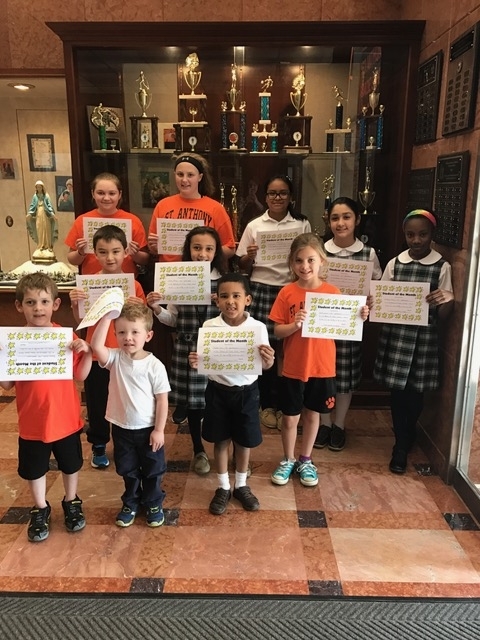 Congratulations to Keegan Baranik (PreK 3), Amelia Bosch (PreK 4), Eryn Banks (K), Gabriella Martinez (1st), Riley Winfield (2nd), Delaney Patterson (3rd), Natalia Alfieri (4th), Eva Pellegrino(5th), Blake Reilly(6th), Hayden Scully (7th), and Peyton Biscoe(8th). Great job! 21st Century Classroom Plan- Although this idea and all planning for it are in the infancy stages, we want to share some exciting news. Our goal is to transform our beautiful library space into a more modern classroom/student work area/media center. The idea for this space was brought to me by Ms. Schiccatano, our Special Education Teacher, and Mrs. Angelo, our school counselor. They have some innovative thoughts for creating a classroom unlike any other traditional classroom in our building. Father Nick liked the idea when I presented it to him, so we will begin to do our research, forge ahead, and plan for this project. More details will follow. 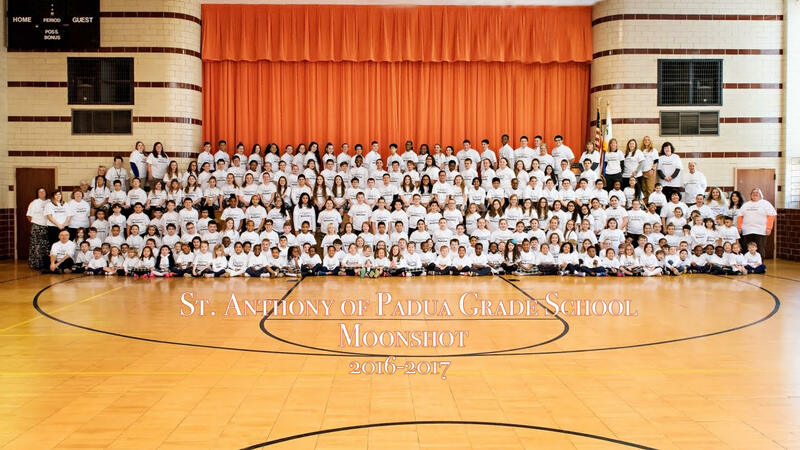 Moonshot – Last week, the entire school came together in our matching Moonshot shirts. We gathered to have a photo taken and will be sending it to former Vice President Joe Biden. The students did a wonderful job being patient while we arranged the entire school for this photo. It turned out great! New Baby News – Congratulations to Matthew Spinelli in Preschool! He is now a big brother to a sister, Madeline Magnolia Spinelli! Upcoming School Year – In an effort to help families plan ahead for next year, I will share some Diocesan scheduling information. The plan is for all students in the Diocese to not return to school until after Labor Day. Now, before you all get excited, I have to remind you we have to plan for our festival (which keeps our school running). In order to follow the Diocesan schedule, which is always our goal, we will lose most of Easter break. Remember that our students get out of school a full week before the other Diocesan schools, and we must account for 180 school days. The good news for planning vacations is that you will have a slightly extended 2017 summer and an earlier start to the 2018 summer. Therefore, Easter break will be compromised. We appreciate your understanding. As soon as we have our Diocesan calendar approved by the Diocese in May, we will publish it. *Reminder – Financial aid packets have to be completed and submitted by March 7th. 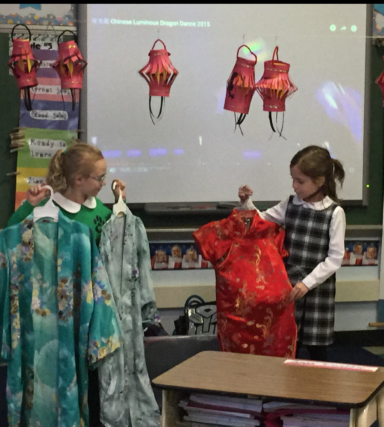 2nd Grade celebrated the Chinese New Year last week by eating traditional foods, learning Chinese customs, and enjoying the gift of special lucky red envelope (hongbao) containing money. February Social – Please join us for the parish socials on Sunday, February 5th, after the 9:00 A.M. and 11:00 A.M. Masses in the Ballad Room of the Grade School. Enjoy a variety of great food, including tomato pie and assorted donuts, while catching up with fellow parishioners and friends. 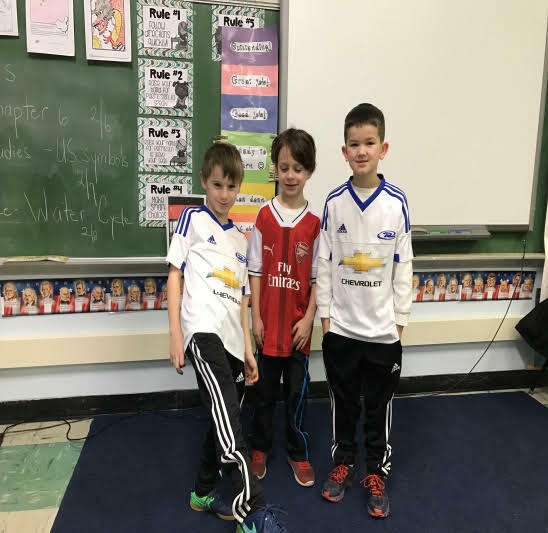 February 6th – Student Council Meeting – PreSchool Room – 3:00 – 3:30 P.M.
February 7th – Math League at St. Anthony’s – 3:30 – 5:00 P.M.
Art Club in Library – 3:00 P.M.
February 16th – School Spelling Bee – Gym – 1:30 P.M.